McGill Ultralight Field, as depicted on the May 1993 Phoenix Sectional Chart (courtesy of Ron Plante). as it was not yet depicted on a 1971 aerial photo. with a single unpaved east/west runway having been carved from the desert. No airfield at this location was depicted on the 1981 USGS topo map. 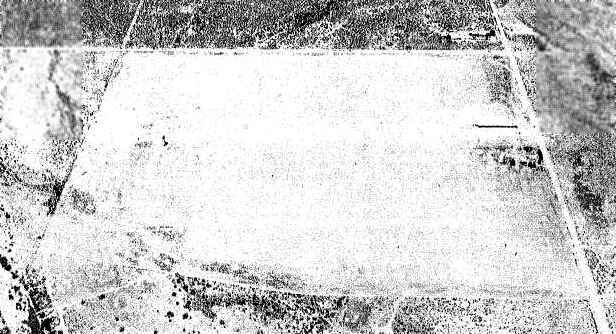 A 1986 aerial view showed a 2nd unpaved runway (oriented north/south) had been added at McGill Ultralight Field. The earliest aeronautical chart depiction which has been located of McGill Ultralight Field was on the May 1993 Phoenix Sectional Chart (courtesy of Ron Plante). It depicted McGill as a private ultralight flight park. along with a cluster of T-hangars to the south of the runways. 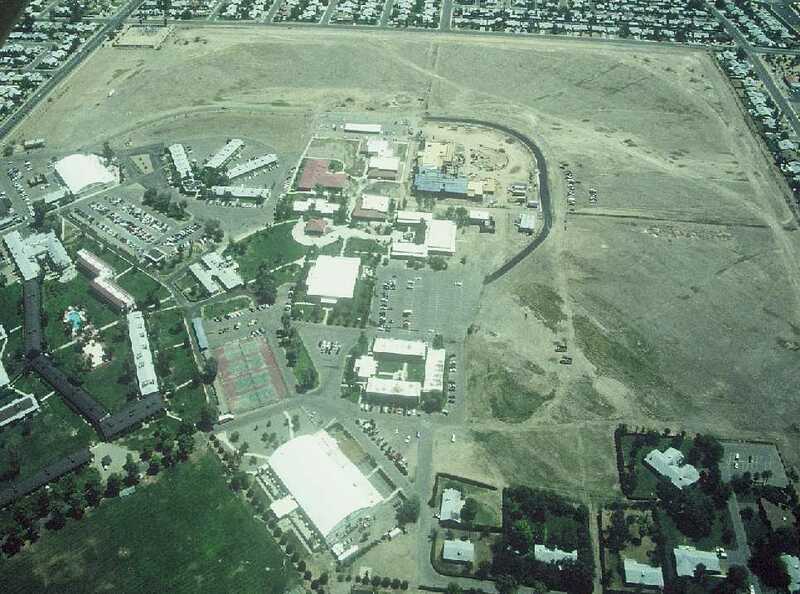 A 1997 USGS aerial view looking north at McGill Ultralight Field. 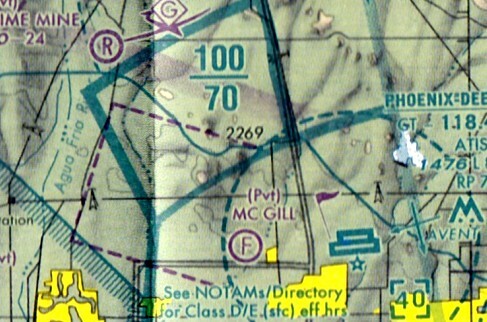 The last aeronautical chart depiction which has been located of McGill Ultralight Field was on the May 1999 Phoenix Sectional Chart (courtesy of Ron Plante). with only their foundations remaining. 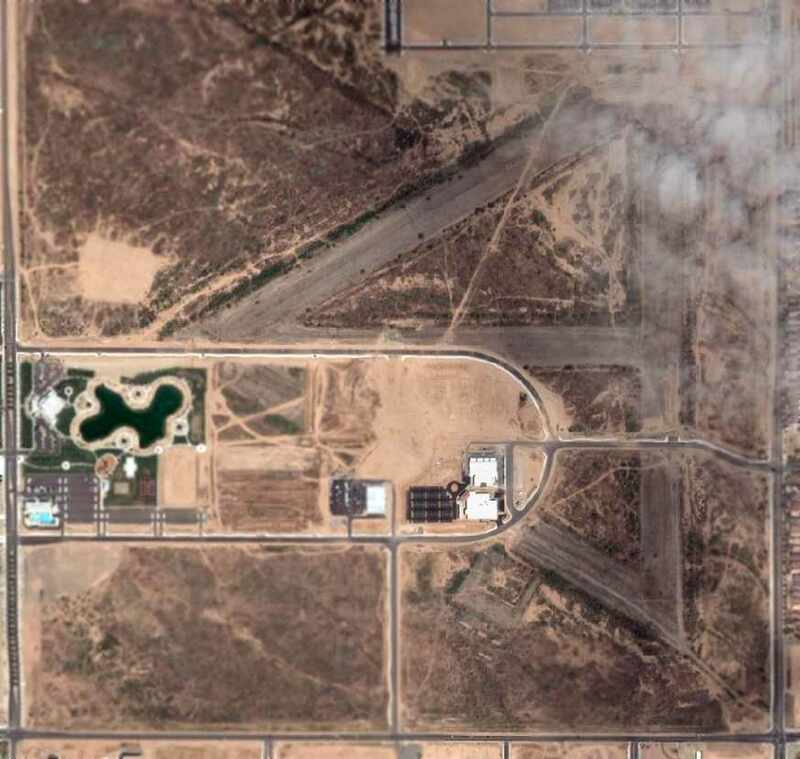 No airfield at this location was depicted on the 2009 Phoenix Terminal Aeronautical Chart. on the south side of the site of McGill Ultralight Field. 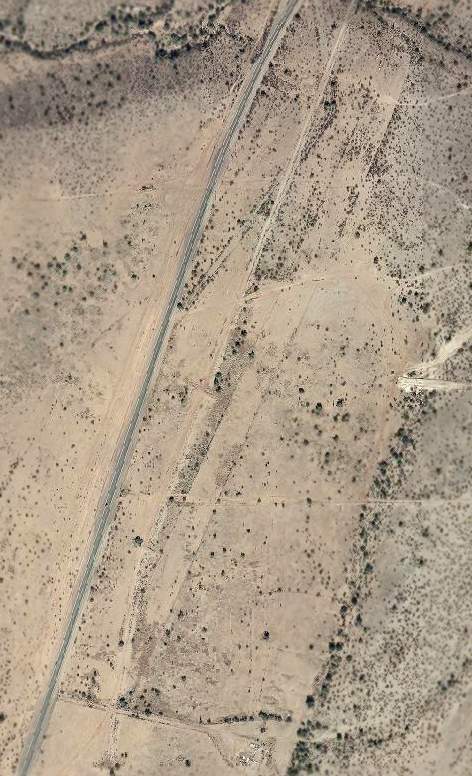 A 2015 aerial view looking north at the remains of McGill Ultralight Field. As of 2016, street maps show the site of McGill Ultralight Field to be located within Adobe Dam Recreation Area. 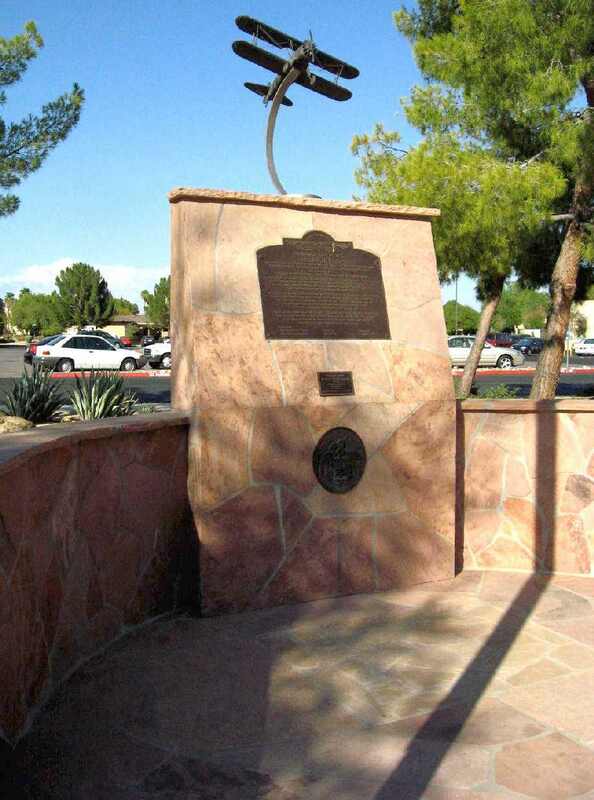 The site of McGill Ultralight Field is located southwest of the intersection of West Pinnacle Peak Road & North 43rd Avenue. Thanks to Doug Landers for pointing out this airfield. 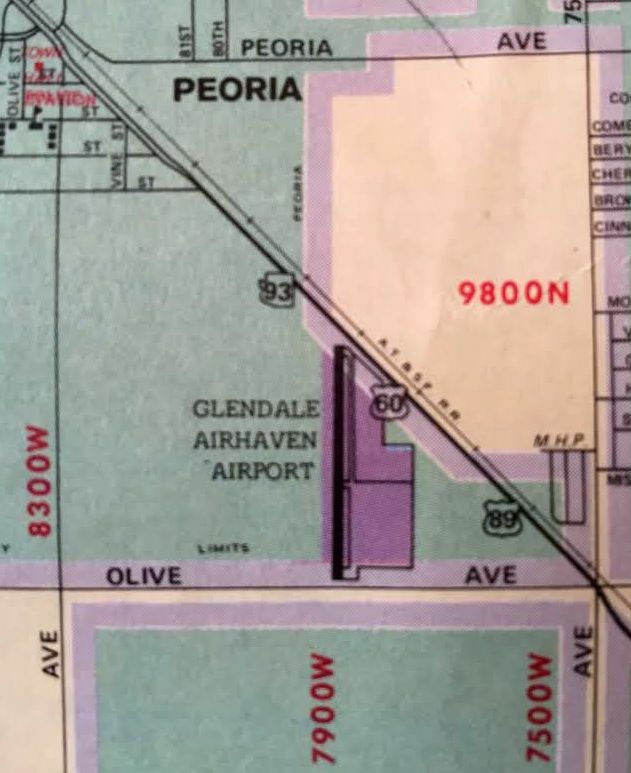 Airhaven Airport, as depicted on the March 1946 Phoenix Sectional Chart (courtesy of David Brooks). nor on the March 1945 Phoenix Sectional Chart (courtesy of Ron Plante). “Phoenix Airhaven Airport Inc. began as a business venture in June of 1945 by 2 businessmen, M. Fanning & S. Stewart after the end of WW2. which depicted Airhaven as a commercial/municipal field. 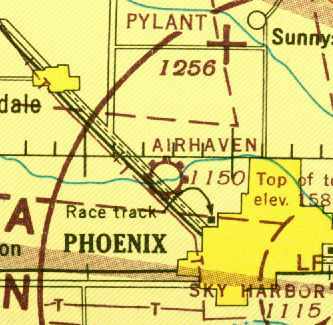 The 1947 Gila River World Aeronautical Chart depicted Air Haven Airport as having a 3,000' unpaved runway. each with a parallel taxiway. 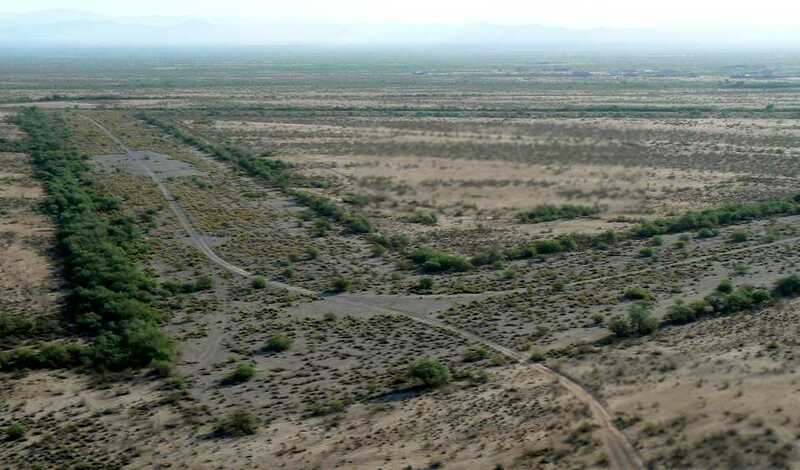 was a 2/14/49 aerial view (from the Maricopa County Flood Control District). 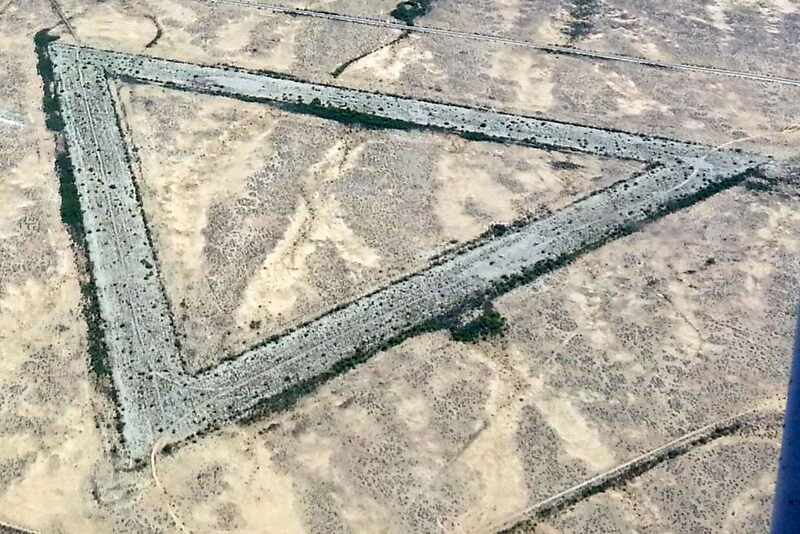 It depicted the field as having 2 unpaved runways in an 'X' shape. More than 2-dozen light aircraft were parked around a few small buildings on the southwest side of the field. 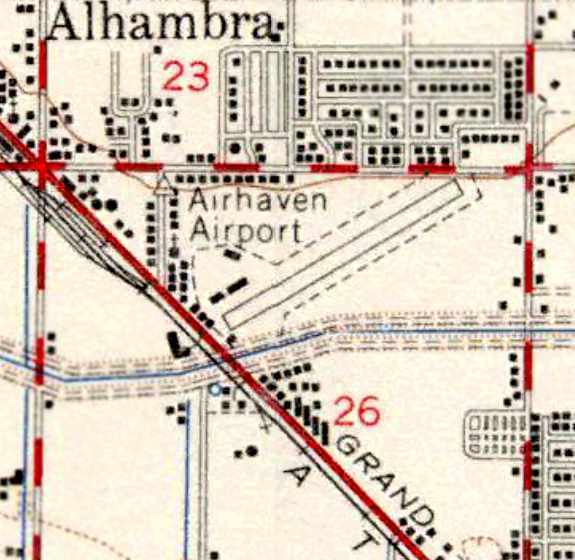 Airhaven Airport, as depicted on a 1949 street map (courtesy of Kevin Walsh). 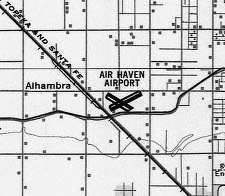 as the 1952 USGS topo map depicted Airhaven Airport as having a single northeast/southwest runway. described Airhaven as having a single 3,000' bare runway. which described Airhaven as having a 3,200' runway on 130 acres. 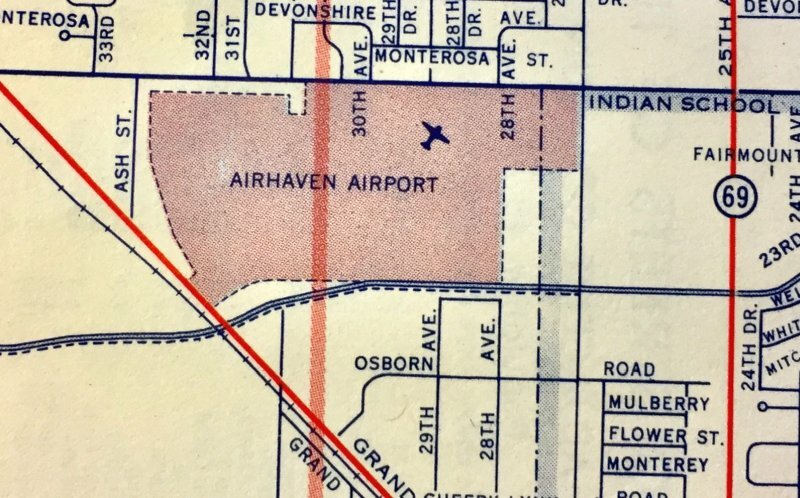 A 1958 streeet map (courtesy of Kevin Walsh) depicted Airhaven Airport as an east/west oriented property outline. with the land of the former crosswind runway having been returned to cultivation. showing dozens of light planes parked around the hangars on the southwest side of the field. 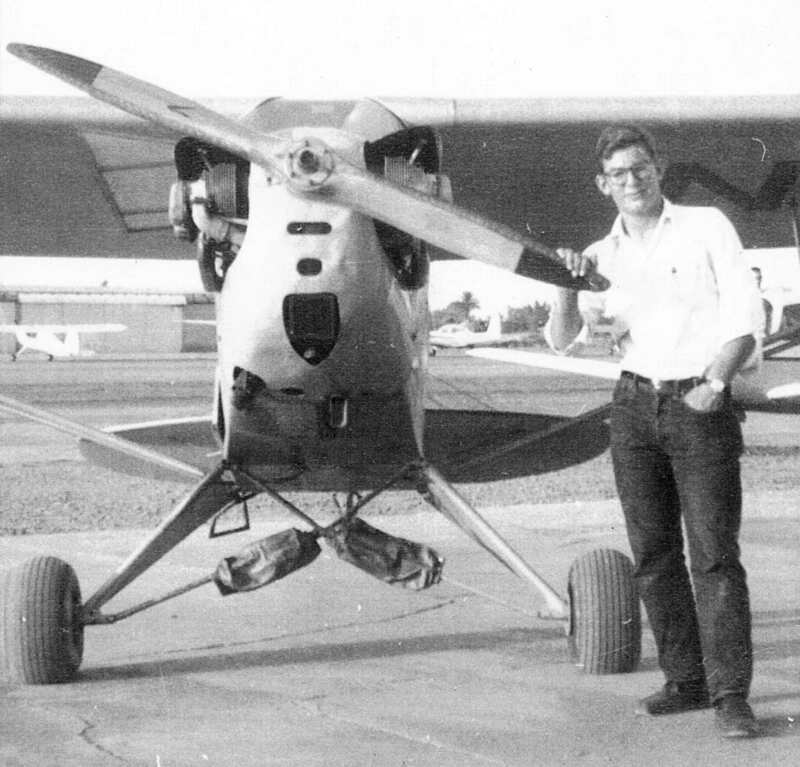 The last photo which has been located of the Airhaven Airport was an 11/13/59 photo of a 17 year-old Jim Hackman with a Piper Cub upon the occasion of his first solo flight. with a parallel taxiway on the northwest side leading to a ramp at the west side of the field with a few small buildings. “In mid-1960, Phoenix Airhaven Airport began winding down its operation. 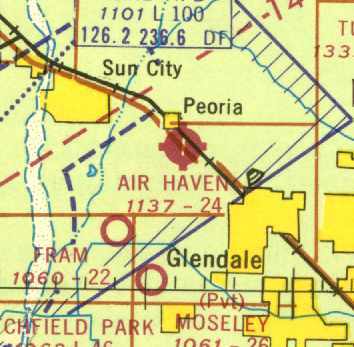 Airhaven was no longer depicted at all on the March 1962 Phoenix Sectional Chart (according to Chris Kennedy). and not a trace appeared to remain of the airport. 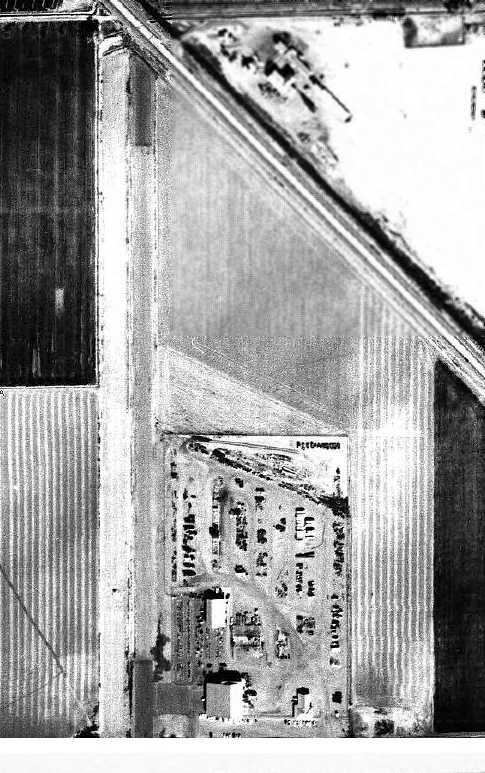 A 1970 aerial view showed that several buildings had been constructed over the site. A 2015 aerial photo showed no trace remaining at the site of Airhaven Airport. of West Grand Avenue & West Indian Schhol Avenue, just north of the Grand Canal. 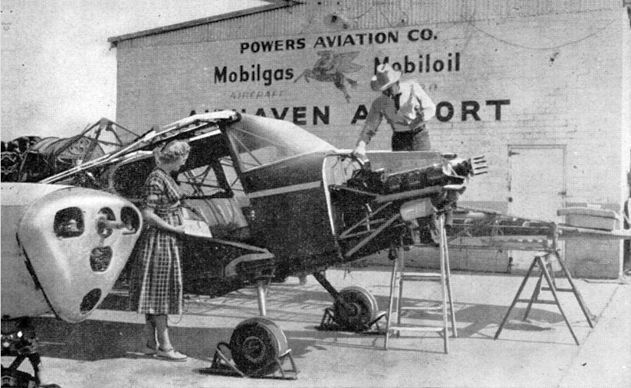 The name Airhaven was later used by a separate airfield in Peoria, 8 miles northwest. 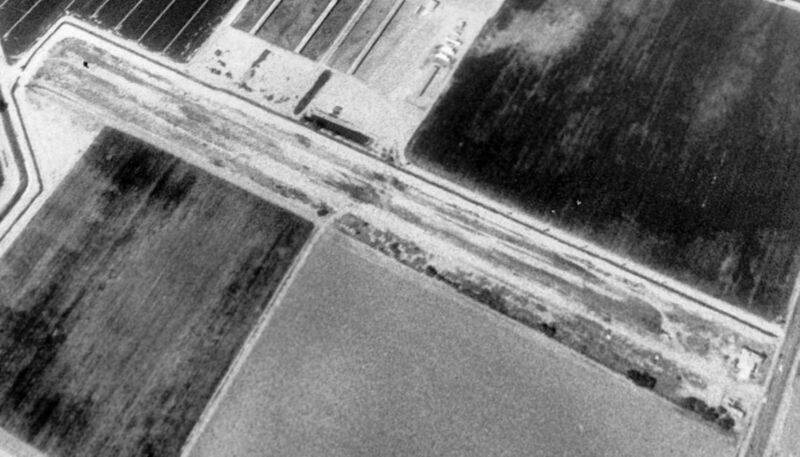 The Isbell Construction Company Airfield, as depicted on a February 20, 1959 aerial view (from the Maricopa County Flood Control District). 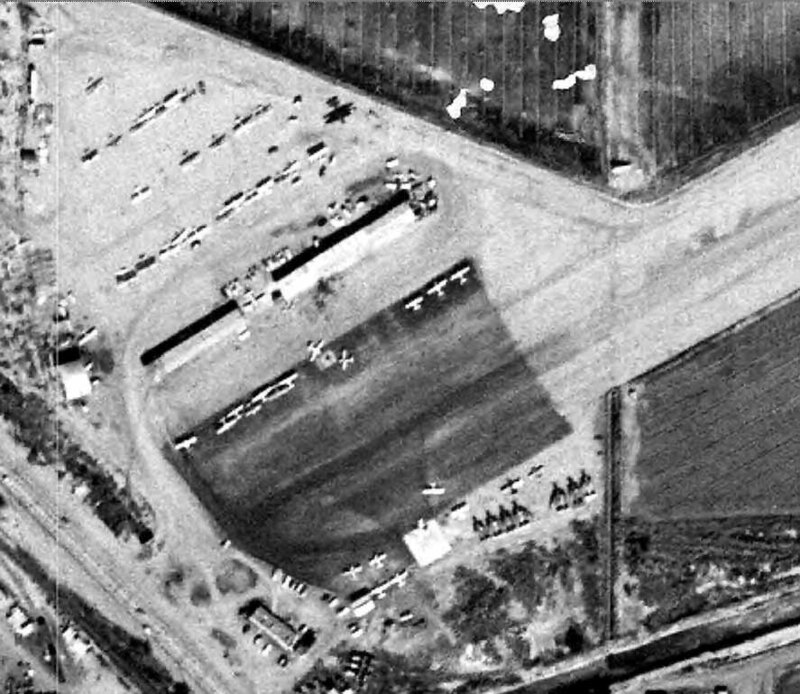 No airfield was yet depicted at this location on a 1949 aerial photo. 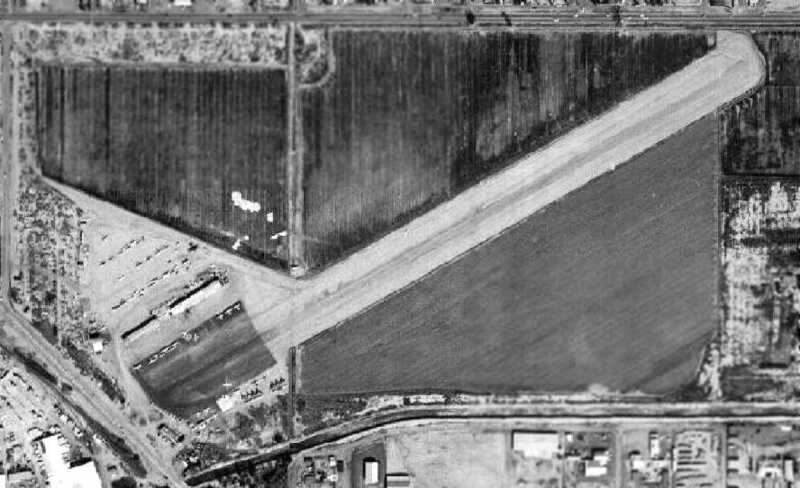 a privately-owned airstrip built in 1955 at 75th & Olive Avenues. 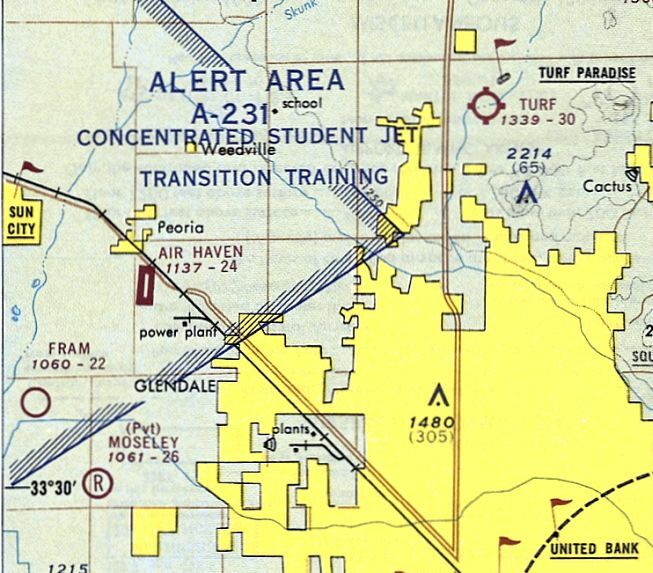 The Isbell Construction Company Airfield was not yet depicted on the 1956 Phoenix Sectional chart (courtesy of John Voss). 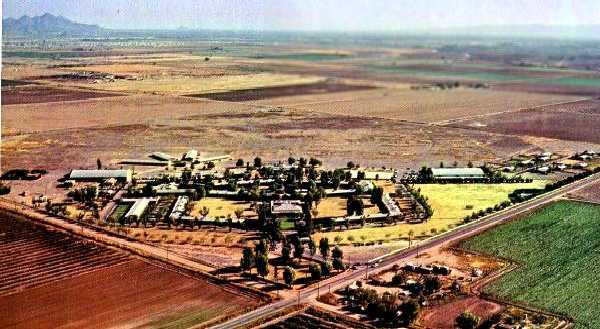 was a 2/15/59 aerial view (from the Maricopa County Flood Control District). with a hangar & at least one other smaller building on the southeast side of the runway. depicted the field in the same configuration. as it was not depicted at all on the July 1965 Phoenix Sectional Chart (courtesy of Ron Kunse). as a private field, operated by Arizona Helicopters, Inc. The field was said to consist of a single 2,400’ bituminous Runway 17/35. or the January 1968 Phoenix Sectional Chart (according to Chris Kennedy). 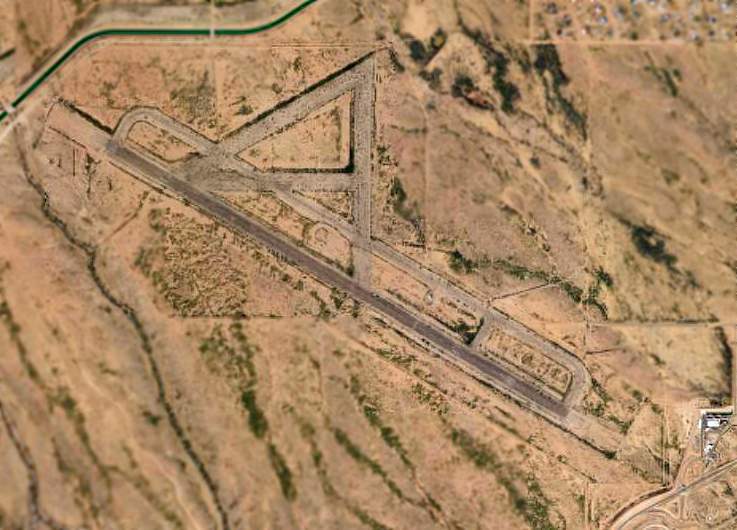 described “Isbell Construction Company” as a private airfield, having the same configuration as described in 1966.
matching the configuration of the “Isbell Construction Company” airfield. but now with over 2-dozen light aircraft parked on the south side. described “Air Haven” as having a single 2,600’ blacktop Runway 17/35. The field was said to have tie-downs. The operators were listed as Air Haven Airport Service (a Cessna dealer) & Precision Helicopters (a Hughes dealer). depicted Air Haven Airport as having a single 2,400' paved north/south runway. as having a single 2,400' paved runway. The 1973 Phoenix Sectional Chart (courtesy of David Brooks) depicted the field simply as “Glendale”. leading to a ramp on the southeast corner of the field with a few small buildings. depicted Glendale Airport as having a single 2,400' paved north/south runway. A 6/2/79 aerial view by Brian Baker (enhanced by Bill Grasha) looking west at Glendale Airport, showing a huge number of light aircraft parked on the field. had increased to over double the area depicted in the 1970 photo. Over 100 aircraft were visible parked on the field. 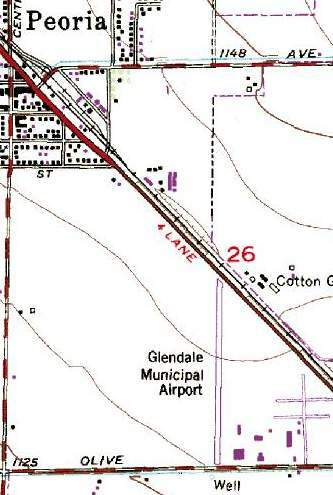 The 1982 USGS topo map depicted Glendale Municipal Airport as having a single north/south paved runway. 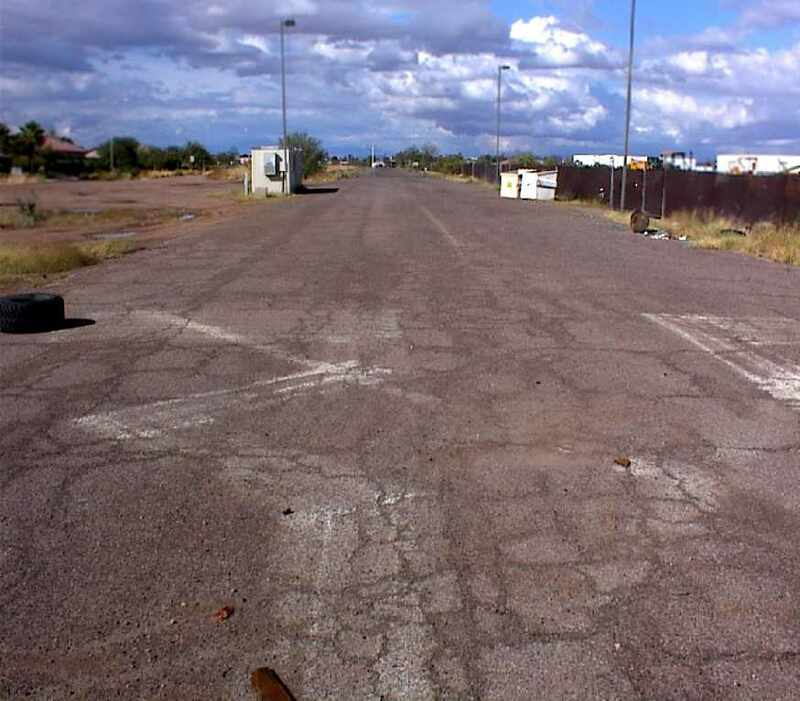 described Glendale Municipal Airport as having a single 2,400' asphalt Runway 17/35. 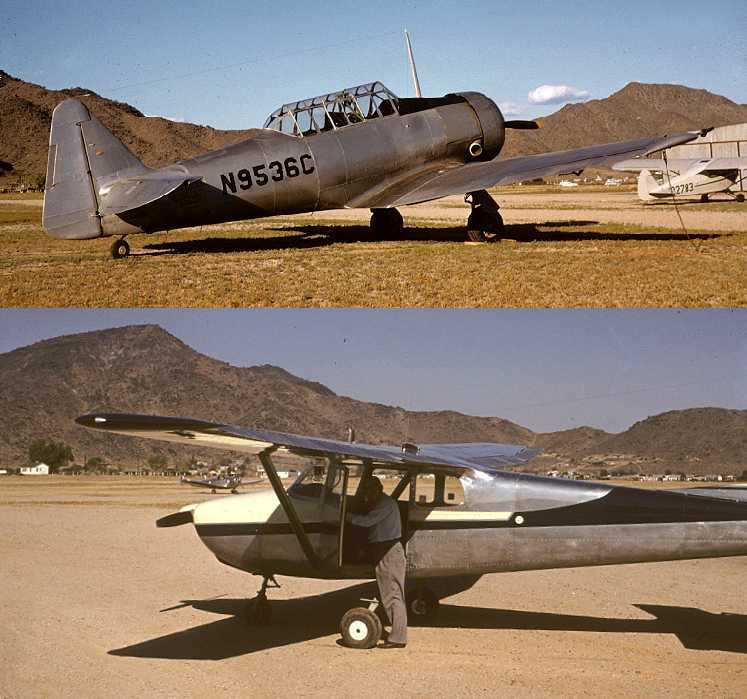 Flight Tech, Arizona Airplanes, Blue Baron Inc., and Alexander Aircraft Service. was on a 1983 street map (courtesy of Kevin Walsh). that would allow plenty of space for expansion. was a 1983 aerial view looking west by Stephen Mahaley (enhanced by Bill Grasha). due to the roads at each end of the end of the runway." was on the 1985 Phoenix Sectional Chart (courtesy of David Brooks). Only the new Glendale Airport was depicted on the 1987 Phoenix Sectional Chart (according to David Brooks). 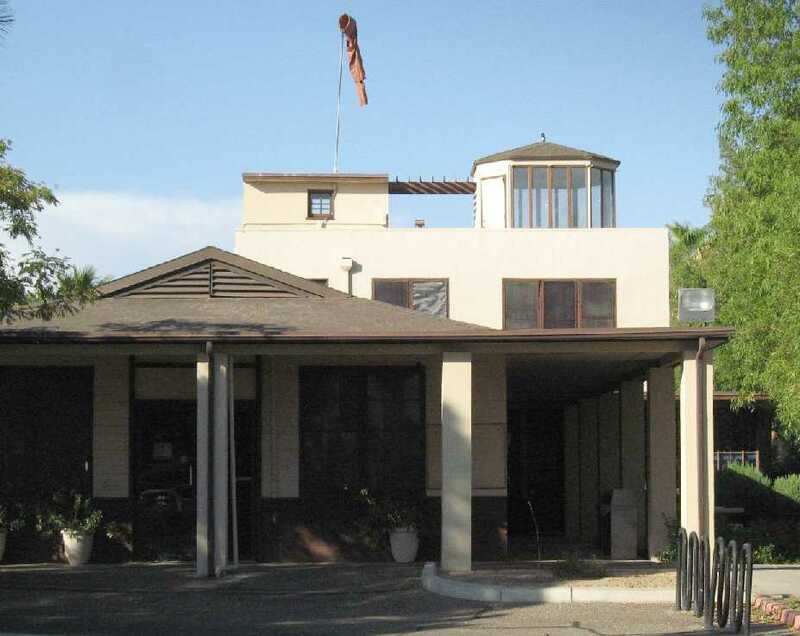 as starting in 1987 it was listed as a private heliport, the “Sunstate-Glendale Helistop (2AZ2)”. with the managers listed as Mike & Dave Watts. The 1988 USGS topo depicted the original airfield as having a single 2,500' runway, oriented north/south. The runway ran right up to Grand Avenue at its northern end, and Olive Avenue at the south. 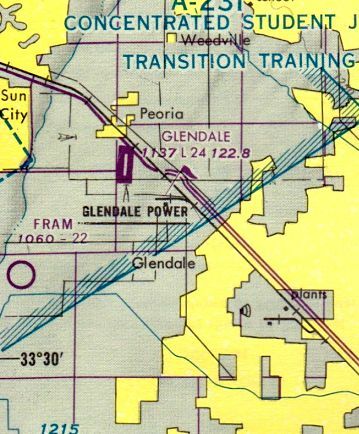 By 1998, aeronautical charts no longer depicted the old Glendale Airport (even as an abandoned airfield). A 2005 photo by Rick Tejera looking north along the remains of Runway 35. 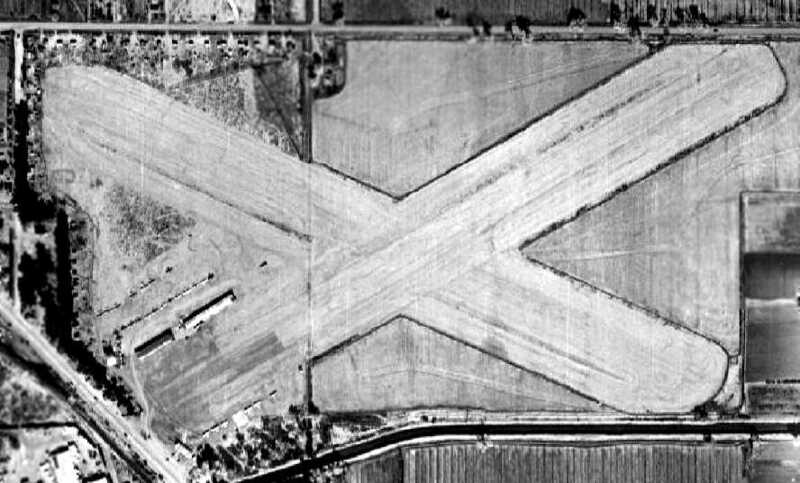 The former runway numbers, and the closed-runway “X” symbol were still clearly recognizable. and found it to be remarkably intact for not having been used for 14 years. along with the helipads (from the original helicopter operation at this field I presume). 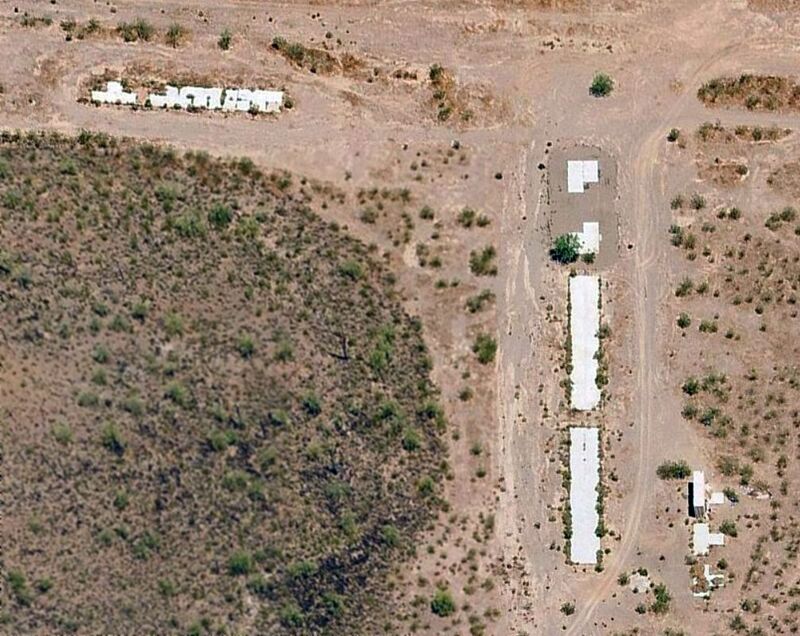 (visible in the aerial photo as small white squares). This one was the only one not covered in old tires. A 2005 photo by Rick Tejera. 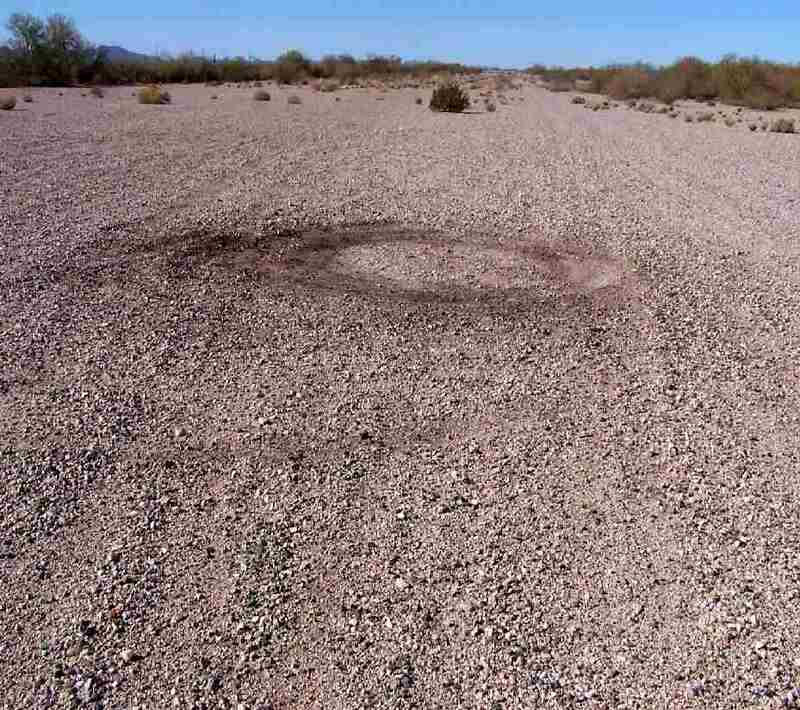 “The round berm of dirt is the remains of the segmented circle, located just north of the helipads. showing the 3 remaining former hangars. 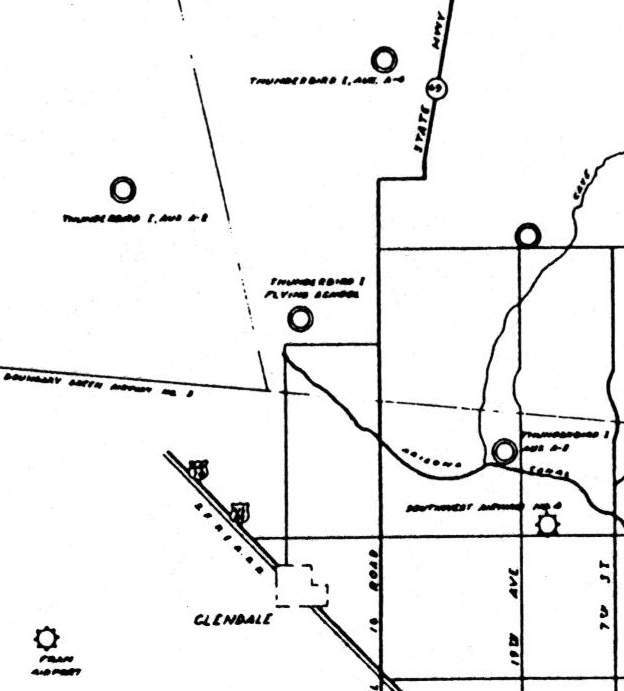 which are still barely visible at the site of the original Glendale Municipal Airport. 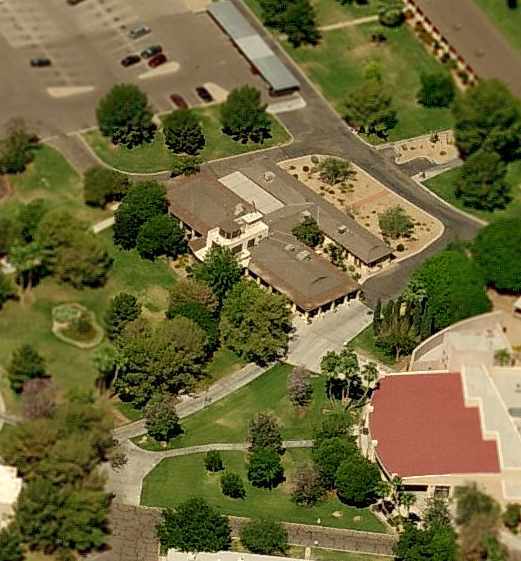 As of 2009 the “Sunstate-Glendale Helistop (2AZ2)” on the property was still listed as a private heliport. 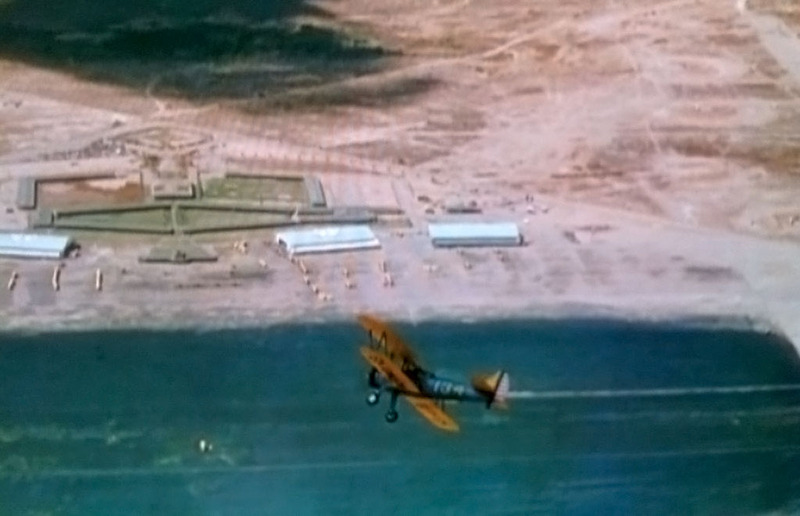 along with what look to be some original airport hangars & the large paved ramp area in the foreground. north of the intersection of West Olive Avenue & North 79th Avenue. 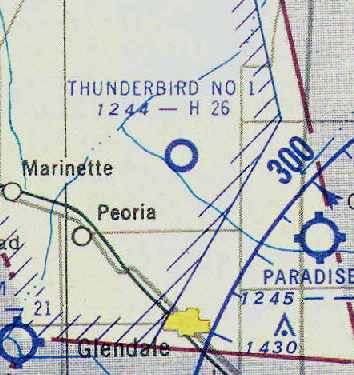 Thunderbird Field, as depicted on the September 1941 Phoenix Sectional Chart (courtesy of Chris Kennedy). 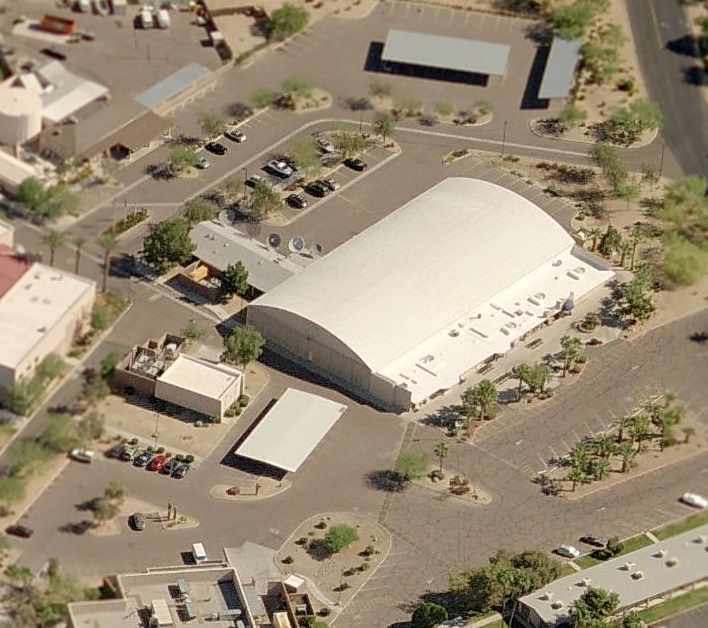 Thunderbird Field #1 was one of 4 contract flying schools operated in the Phoenix area by Southwest Airways. The site was laid out to look from the air like an etching of a mythical Anasazi Thunderbird, and so it was called Thunderbird Field. 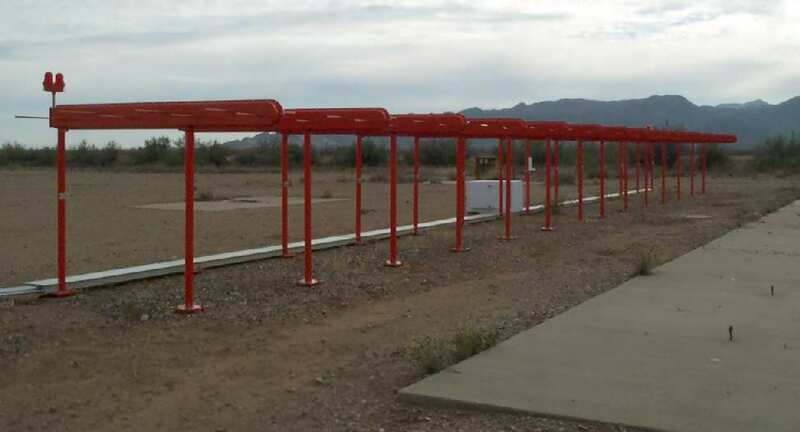 (at the eventual locations of Falcon Field, Scottsdale Airport, and adjacent to Sky Harbor Airport). (according to Nelda Crowell, Archivist of the Thunderbird School of Global Management). Thunderbird Field was a contract flying school, operated by Southwest Airways. 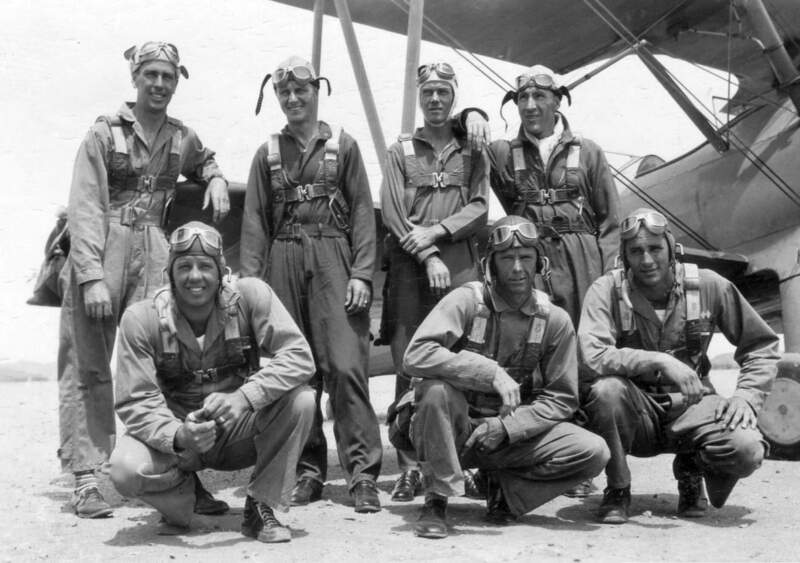 They were contracted to train American, Canadian, British & Chinese military pilots. Stearman biplane trainers were operated at Thunderbird. The installation consisted of a number of hangars, barracks, and other buildings. and across West Greenway Road to the north was the airfield itself, with three 3,500' runways. was on the September 1941 Phoenix Sectional Chart (courtesy of Chris Kennedy). until 1942, when the US Army Air Corps took over control & funding of the pilot training at Thunderbird. 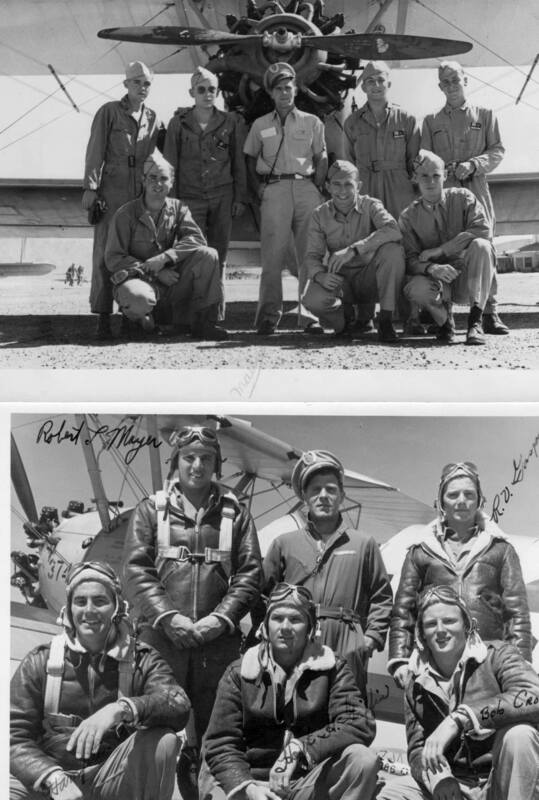 The earliest photos which has been located of Thunderbird Field was a series of stills from the 1942 movie “Thunder Birds” (courtesy of Tim Tyler, enhanced by Bill Grasha). 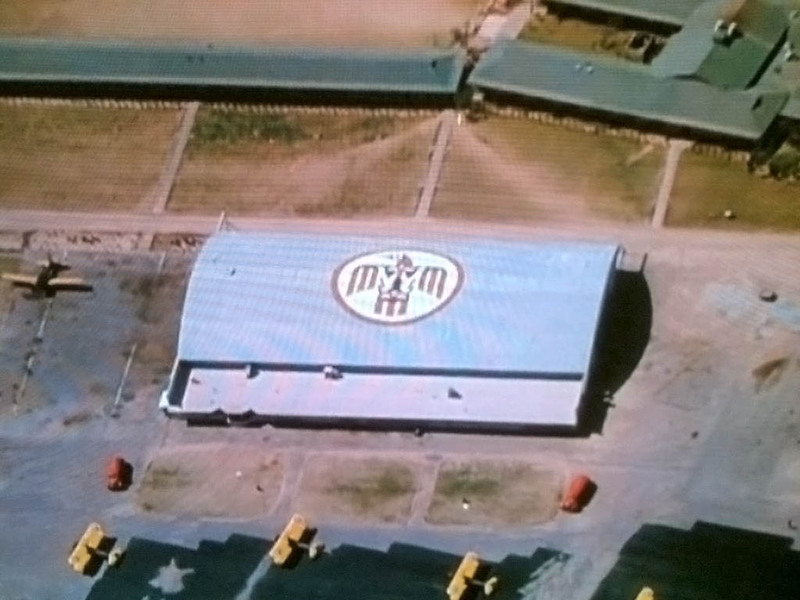 An aerial view looking northwest at the Thunderbird logo on top of one of the hangars, from the 1942 movie “Thunder Birds” (courtesy of Tim Tyler, enhanced by Bill Grasha). 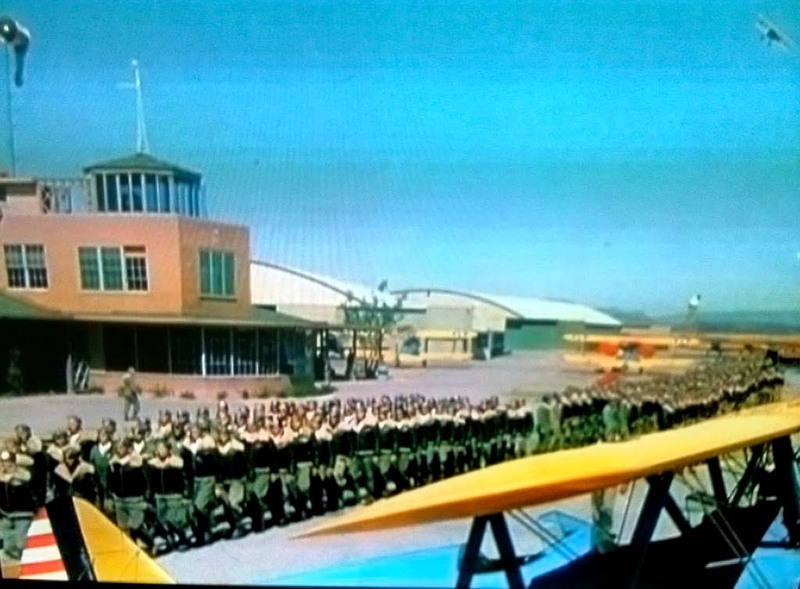 A still from the 1942 movie “Thunder Birds” (courtesy of Tim Tyler, enhanced by Bill Grasha) showing Stearman trainers & cadets marching in front of the Thunderbird control tower. along with several on the paved landing mat. A series of 3 runways extended toward the north across the road in the foreground. A 1942 aerial view by Steve Magdich looking south at Thunderbird Field from a PT-17 Stearman (courtesy of Lon Magdich). Lon Magdich recalled, “Thunderbird Field... My father was a Primary Flight Instructor there from April 1942 through January 1944. A 1942 photo by Steve Magdich of the Thunderbird Field control tower (courtesy of Lon Magdich). A circa 1942 photo by Steve Magdich of Stearman biplane trainers in front of Thunderbird Field's B hangar, taken from the control tower (courtesy of Lon Magdich). A 1943 photo of Thunderbird Field flight students (front row) & instructors (back row) (courtesy of Lon Magdich). Lon Maddich observed his father, Steve Magdich, is on the back row at right. depicted "Thunderbird" as a military airfield. including her father Morris McLaughlin, her Uncle Wallace Pankratz, and his best friend Jerry McWayne. on the southeast corner of West Greenway Road & North 59th Avenue. and across West Greenway Road to the north was another three 3,500' runways. Surrounding the runways were a large number of revetments or bunkers (of unknown purpose). 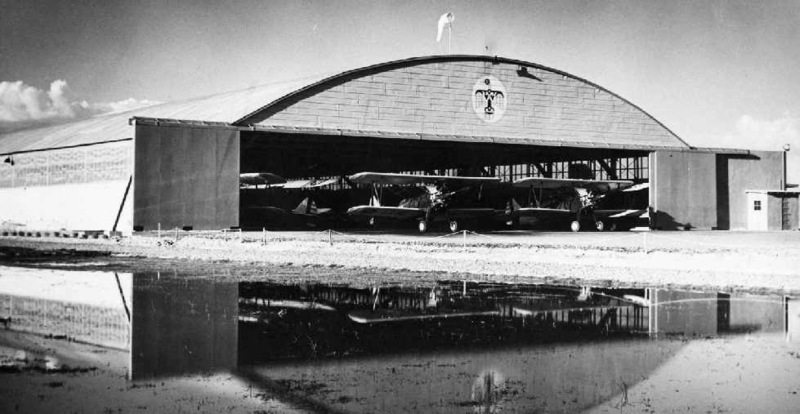 A circa 1943 photo (enhanced by Bill Grasha) of Stearman PT-17 biplanes in front of a Thunderbird hangar (decorated with the school's logo). A 1943 photo (enhanced by Bill Grasha) of a Vultee BT-13 Valiant monoplane & a Stearman biplane in front of a Thunderbird hangar (decorated with the school's logo). 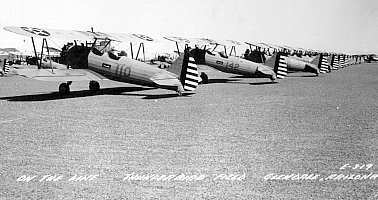 An undated (circa 1941-45) photo of Stearman biplane trainers at Thunderbird Field. An undated (circa 1941-45) photo of Stearman biplane trainers inside a Thunderbird hangar (enhanced by Bill Grasha). A 1944 USAAF map of Thunderbird Field (center of map) & its satellite airfields (courtesy of John Voss). and Southwest Airways #4 (located 7 miles southeast, of which no recognizable airfield remains). on the March 1945 Phoenix Sectional Chart (courtesy of Chris Kennedy). Thunderbird #1 was said to have four 200' x 102' wood & metal hangars. and to have 3 auxiliary fields. 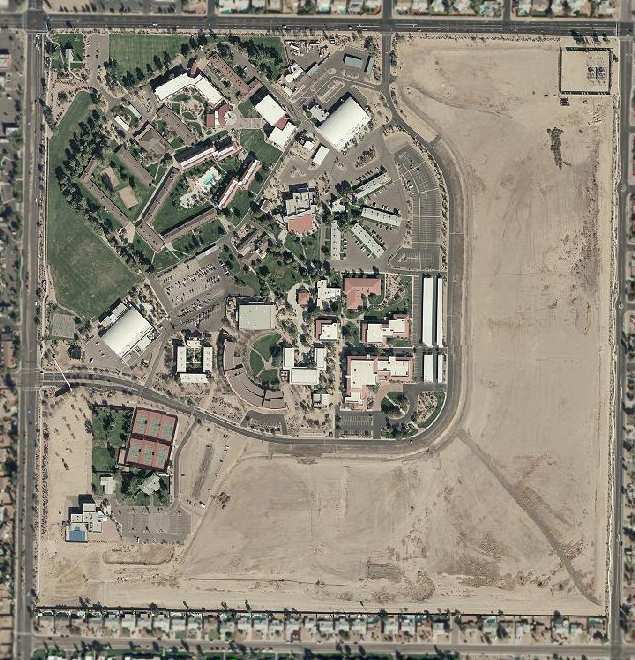 Following the end of WW2, Thunderbird Field was declared surplus by the War Assets Administration in 1946.
the commanding general of the U.S. Army Air Training Command. and classes reportedly began on the site within a few months. 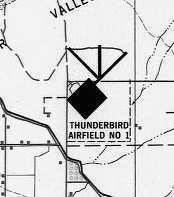 as Thunderbird Field continued to be depicted on aeronautical charts for several more years. 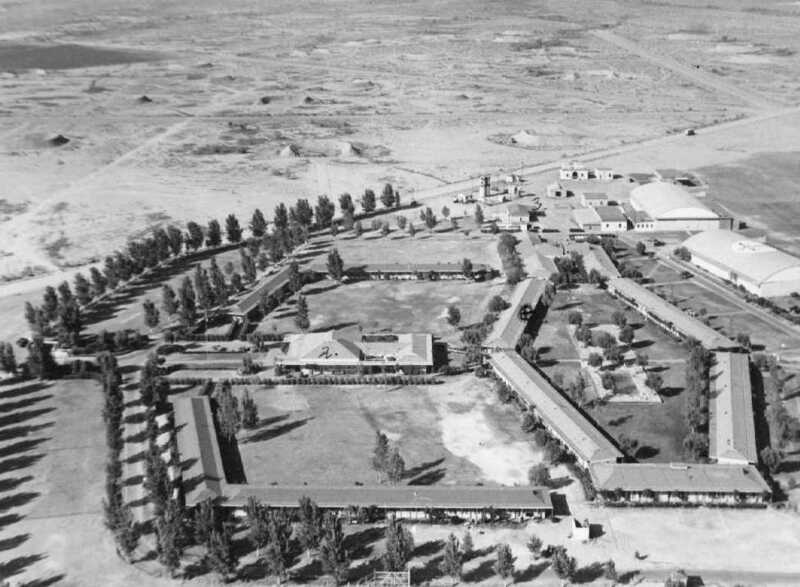 A 1946 aerial view looking northeast at the buildings of Thunderbird Field, by that point reused as the American Institute for Foreign Trade. The 2 hangars are seen on the right, and the 3 runways in the background on the north side of the road. 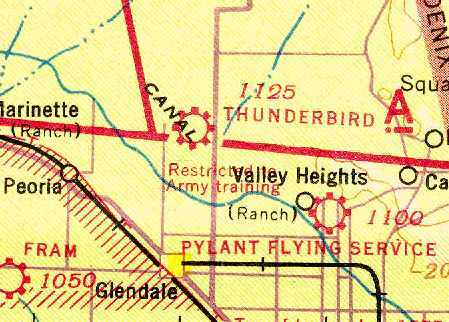 Thunderbird Field was not depicted on the 1947 Gila River World Aeronautical Chart. with the large landing mat on the south side, and 3 runways to the north. depicted the Thunderbird hangars & landing mat on the south side of the field. and the remains of the 3 runways on the north side of the road. The path of the north/south runway had become North 55th Avenue, north of West Greenway Road. "Thunderbird #1" was still depicted on the September 1953 Phoenix Sectional Chart (courtesy of Chris Kennedy). and it was said to consist of a single 2,580' hard surface runway. as it was no longer depicted at all on the September 1954 Phoenix Sectional Chart (according to Chris Kennedy). the hangars & former ramp area remained intact, without any redevelopment. 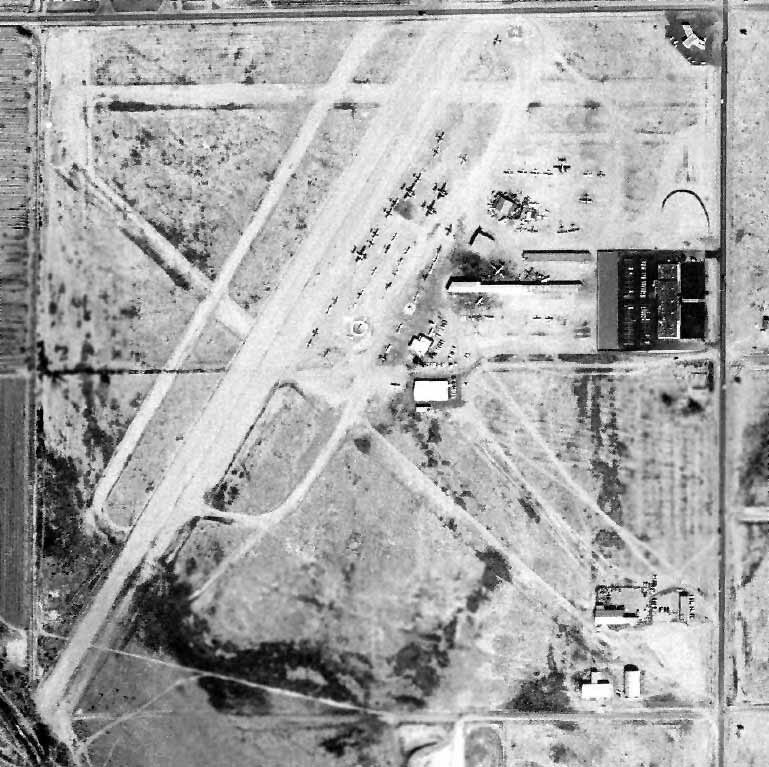 A 1965 aerial view looking southeast at Thunderbird Field showed that the hangars & former landing mat remained intact. Note also the complete lack of any surrounding residential development. “After the property was given to the American Institute for Foreign Trade, the runway remained intact for many years. 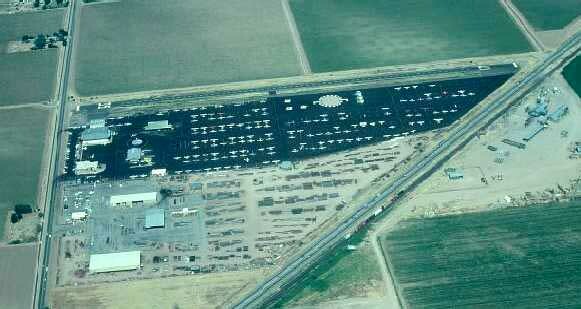 A 1970 aerial view still showed the former airfield in a basically unchanged state. but many of the WW2-vintage airfield buildings remained standing. 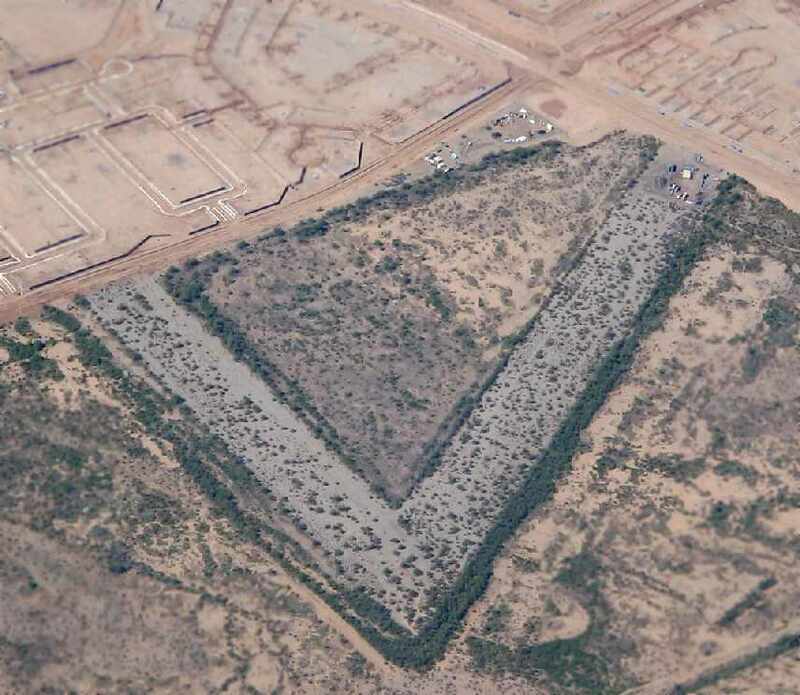 A circa 2001 aerial photo of the site of Thunderbird. Note the 2 large white arch-roof hangars, one at the top-center & the other at the center-left. 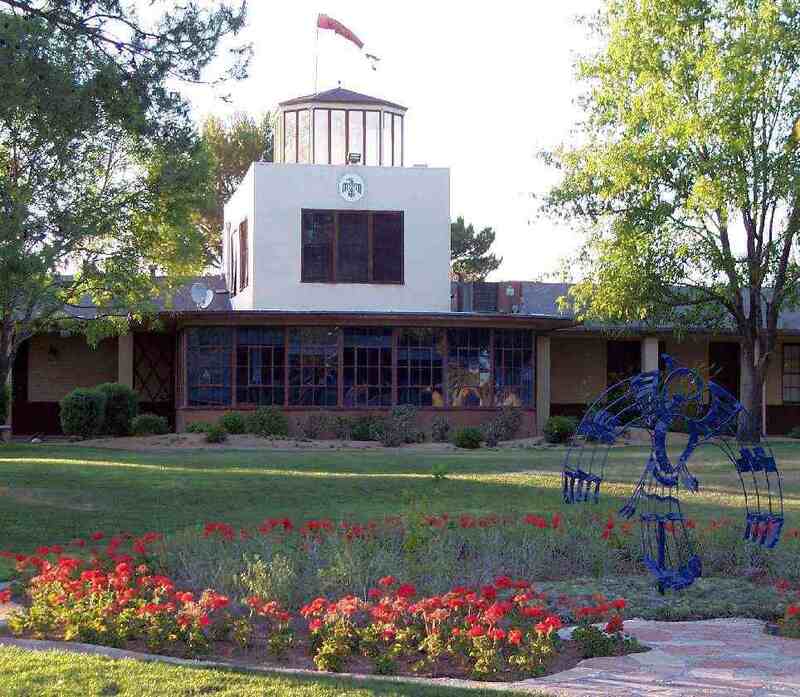 which are now reused as the Thunderbird Graduate School. known currently as Thunderbird, The American Graduate School of International Management. including the airfield control tower, barracks & 2 large airplane hangars. one of 2 which remains standing. 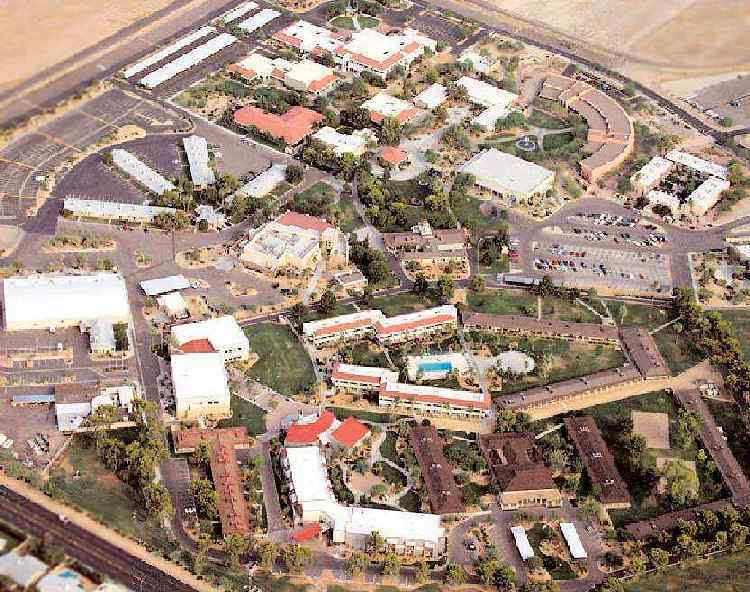 A circa 2006 aerial view looking west at Thunderbird's former control tower building. A 2007 photo by Steve Owen of the former Thunderbird control tower building, which still sports a windsock on top. A 4/2/09 photo of the original Thunderbird Field control tower building. The former tower building currently houses student government offices, a student lounge, and the Tower Cafe. Thunderbird is located southeast of the intersection of West Greenway Road & North 59th Avenue. from the 1945 Army Air Forces Directory of Airfields (courtesy of Chris Kennedy). This airfield was originally one of at least 4 satellite airfields used during WW2 by the cadets from Thunderbird Field. as it was not depicted at all on the September 1941 Phoenix Sectional Chart (courtesy of Chris Kennedy). was a 1943 aerial view from the 1945 Army Air Forces Directory of Airfields (courtesy of Chris Kennedy). 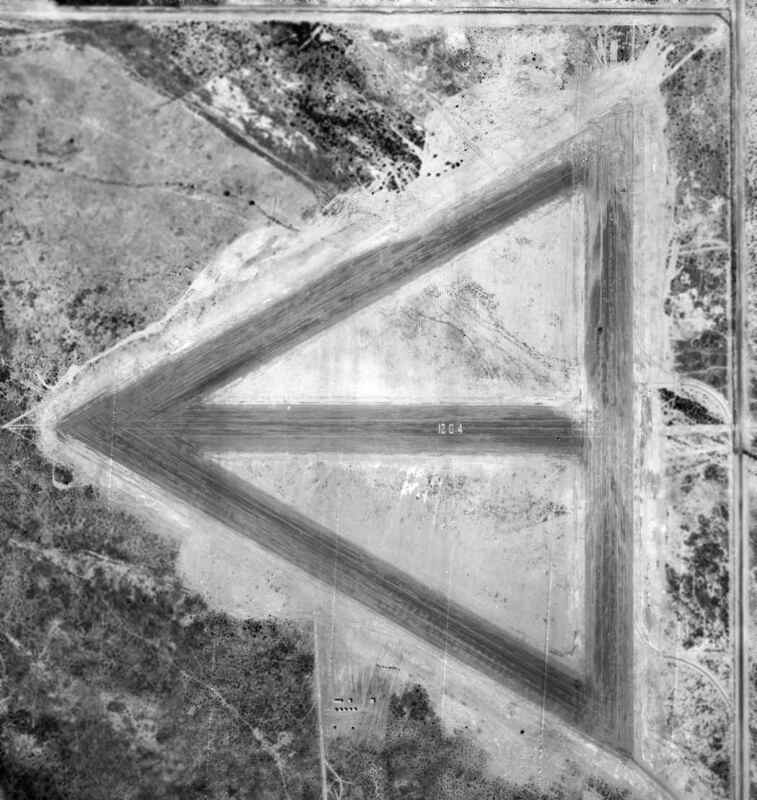 The aerial view depicted the airfield as consisting of an unpaved square landing area. as a 160 acre square property within which was a 2,640' square “sod” all-way field. The field was described as not having any hangars, and to be privately owned & operated. was on the 1948 USAF Phoenix Urban Area Chart (courtesy of Scott O'Donnell). 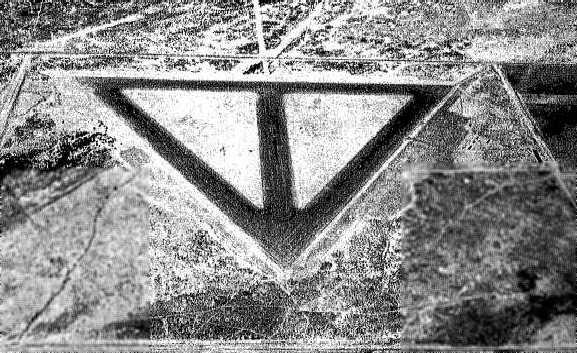 It depicted a square outline, labeled “AF Aux Landing Area”. 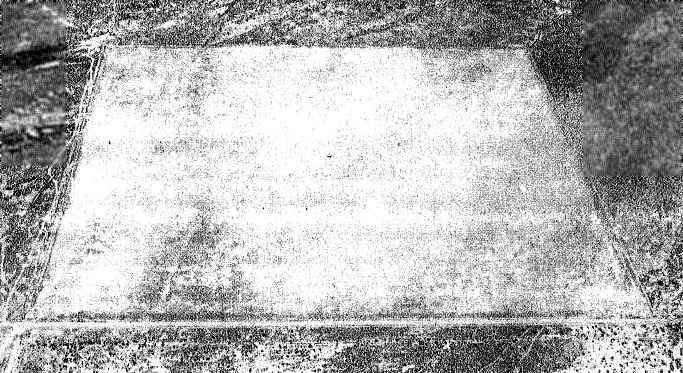 did not depict any specific trace of an airfield, just a square plot of land. as it was no longer depicted on subsequent aeronautical charts. and not a trace of the airfield appears to remain. 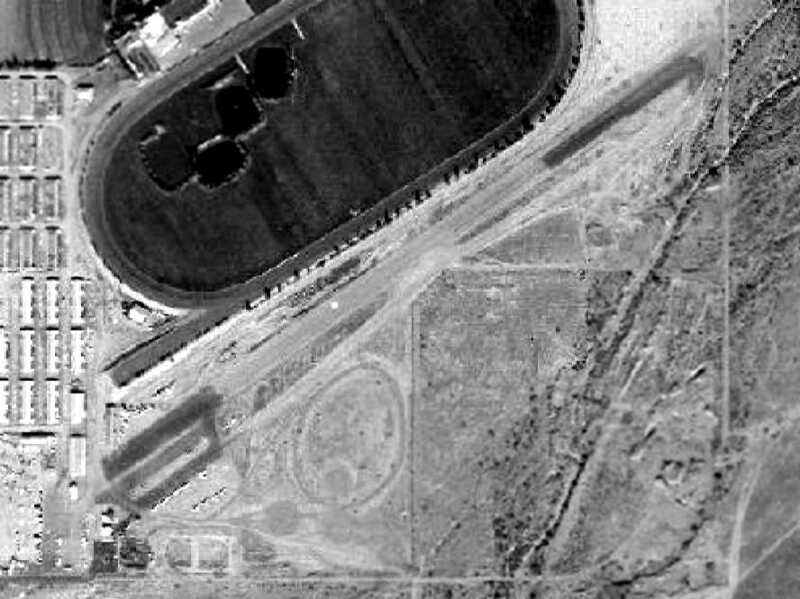 Note: Another airfield, for the Turf Paradise Racetrack, was later built on the opposite (south) side of West Bell Road. 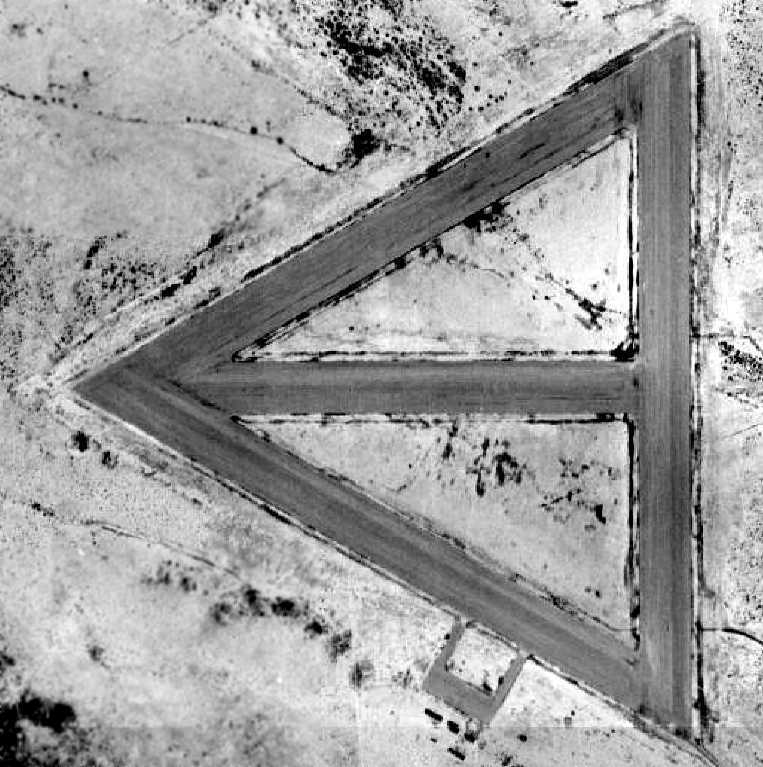 The site of Thunderbird #1 Auxiliary Airfield #1 is located northeast of the intersection of West Bell Road & North 19th Avenue. as a 240 acre square property within which was a 3,423' square “sod” all-way field. nor on subsequent aeronautical charts. 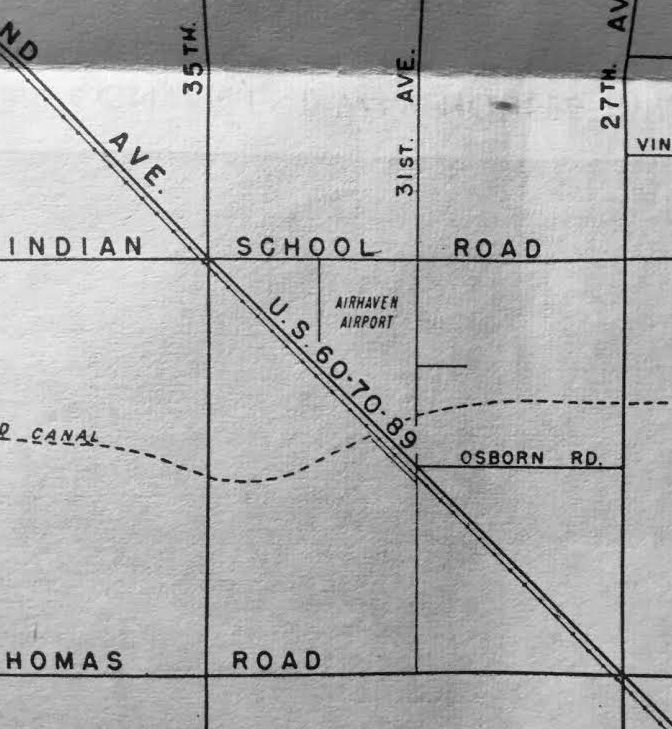 The site of Thunderbird #1 Auxiliary Airfield #2 is located northwest of the intersection of West Union Hills Drive & North 83rd Avenue. “Pylant Flying Service” Airport, as depicted on a 1940 HM Gousha Company map (courtesy of Curtis Carroll). According to Curtis Carroll, “Earl Pylant was an Arizona native & aviation pioneer. He had his pilot’s license by the time he was 17. The earliest depiction which has been located of Pylant Airport was a 1940 HM Gousha Company map (courtesy of Curtis Carroll). 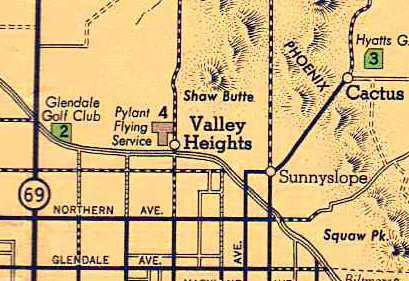 It depicted the “Pylant Flying Service” Airport as being T-shaped, on the northeast side of Valley Heights. in which Manuel Gutierrez was killed after his small cabin monoplane caught some wires on its landing approach to Pylant Airport. 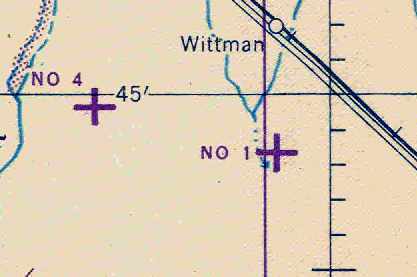 No airfield was depicted at this location on the September 1941 Phoenix Sectional Chart (courtesy of Chris Kennedy). According to Curtis Carroll, “Pylant enlisted in the Army Air Corps on 10/21/42. Pylant Airport was used during WW2 as Thunderbird Auxiliary Field A3. was a 1943 aerial view looking north from the 1945 Army Air Forces Directory of Airfields (courtesy of Chris Kennedy). with what may have been some buildings on the east side of the field. “In 1945, with the end of Word War II in sight, Southwest Airways began scaling down the flight operations at both Thunderbird Airfields. and began selling them off for use as private-use airports. In 1945, E. Pylant, a pilot, purchased this airfield property with the intention of starting a flying school. After completing the purchase agreement, Pylant began renovating the military airfield. According to Curtis Carroll, “Once the military need ended, Pylant changed the proper name of the facility to Paradise Aviation Co., Inc. and the name of field to Paradise Airport. 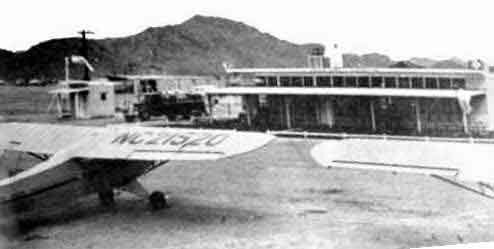 The earliest depiction which has been located of Paradise Airport was on the 1947 Gila River World Aeronautical Chart. It depicted Paradise Airport as having a 3,200' unpaved runway. but strangely it did not depict any runway configuration. 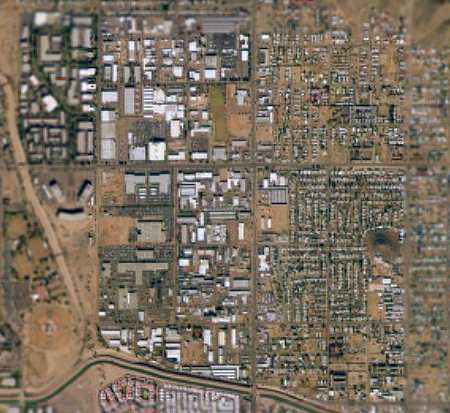 was a February 14, 1949 aerial view (from the Maricopa County Flood Control District). It depicted the field as consisting of a largely square dirt field, with 3 hangars on the east side of the field. showing a total of 2-dozen single-engine aircraft around the hangars of Paradise airport, the longest of which was painted with “Paradise” on its roof. 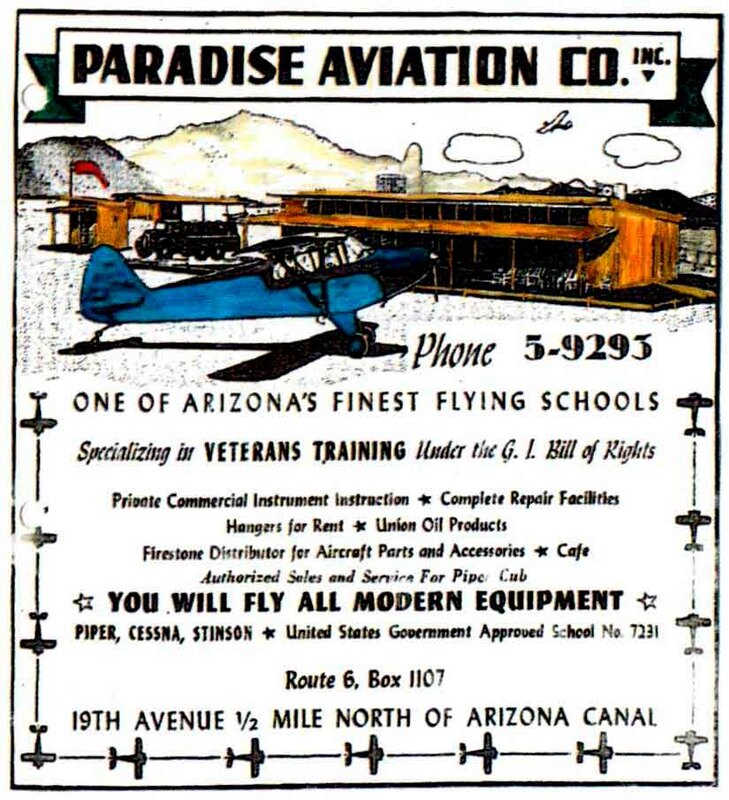 described the company as “One Arizona's finest flying schools”. Two circa 1950s photos by Richard Bertram of an AT-6 & a Cessna at Paradise Airport (courtesy of Bob Bertram). A circa 1950s photo of 2 Piper Cubs in front of a building at Paradise Airport (enhanced by Bill Grasha). The Aerodrome table on the 1956 Phoenix Sectional chart (courtesy of John Voss). described Paradise Airport as having a total of 4 runways, with the longest being 3,200'. A 1958 photo by Brian Baker (enhanced by Bill Grasha) of one of Don Underwood's NAF N3N-3s, N44831, PW985 duster, with a B-25 Mitchell bomber in the background. 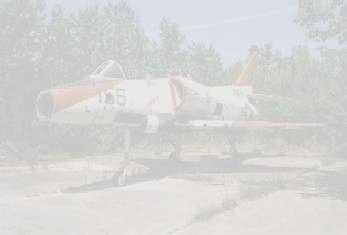 Brian recalled, “It was taken at Paradise Airport before Don moved his crop spraying business over to Deer Valley. 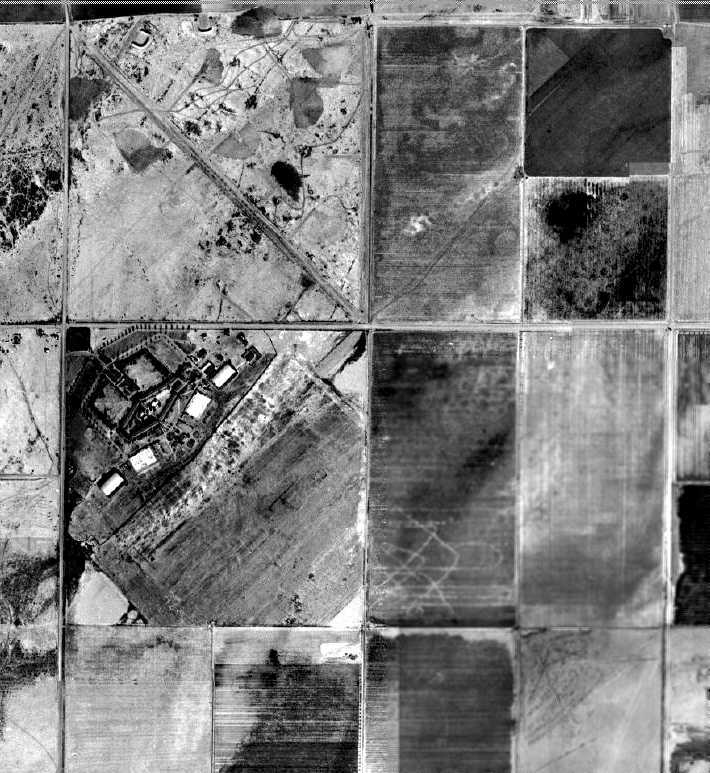 was a February 20, 1959 aerial view (from the Maricopa County Flood Control District, enhanced by Bill Grasha). It showed that the field had been improved at some point between 1949-59 with 3 unpaved runways & several additional hangars. including several relatively larger twin-engine aircraft. due to the increase in new development that was starting to appear along the airport property. 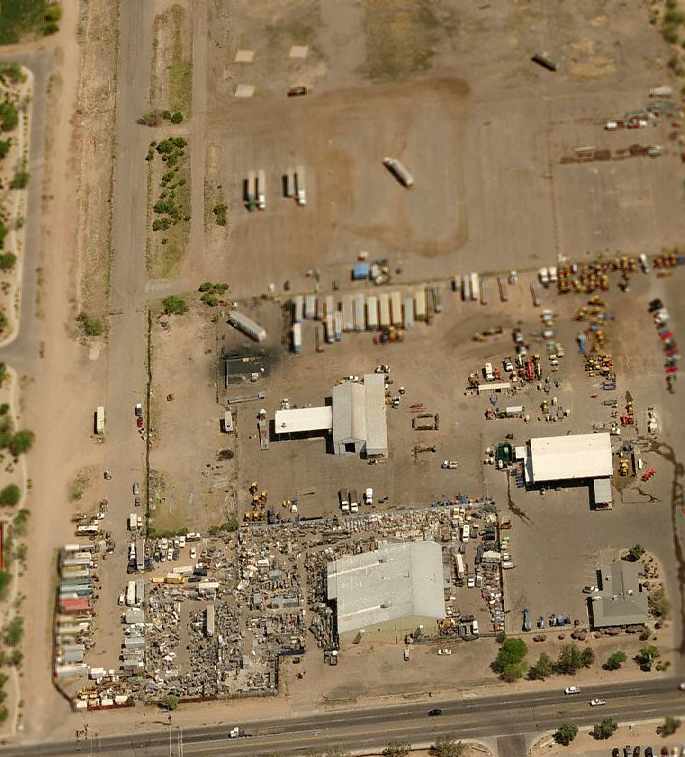 In 1959 [airport owner] Kilbourne decided to sell the property to a developer who had plans to turn the area into an industrial park for the AZ Public Service Company. and several buildings had been built over the western & eastern portions of the field. 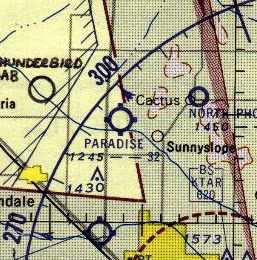 Paradise Airport was no longer depicted at all on the July 1965 Phoenix Sectional Chart (courtesy of Ron Kunse). 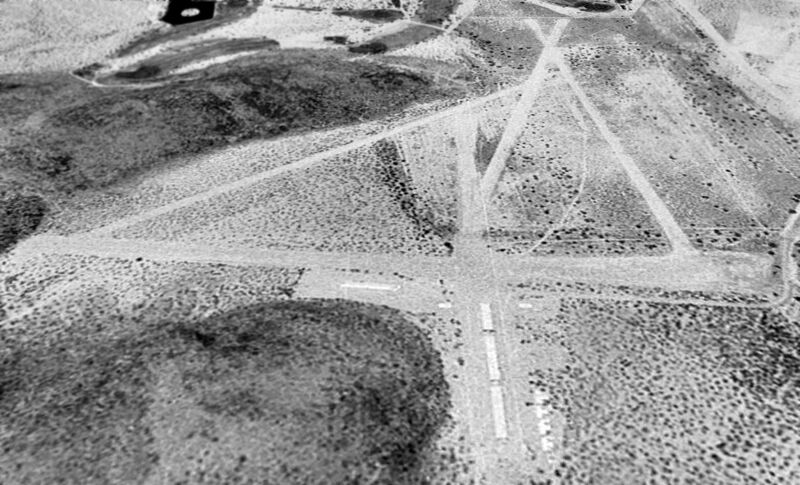 Traces of several runways were still recognizable in a 1969 aerial view (from the Maricopa County Flood Control District). not a trace remained of the former Paradise Airport. In this circa 2001 aerial photo the property has been extensively redeveloped. Two buildings which were visible in the 1959 aerial view appeared to still remain standing in a 2005 aerial view. The site of the former airfield is located at the intersection of West Peoria Avenue & North 19th Avenue. It is just south of Shaw Butte, and north of the Arizona Canal. 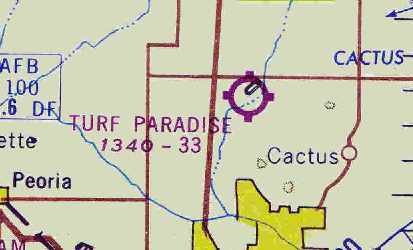 A later airfield, Turf Paradise Airfield, was located 4 miles to the north of Paradise Airport. depicted the airfield as having a single unpaved northeast/southwest runway. used to support flight training operations at nearby Thunderbird Field. 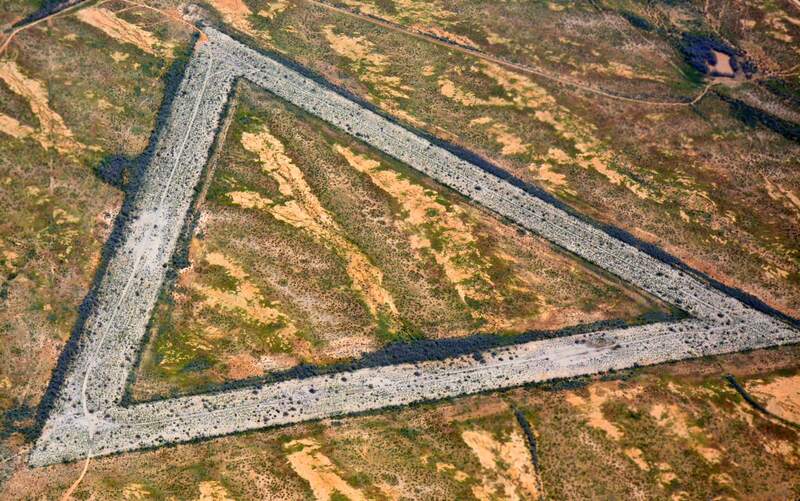 The date of this airfield's construction has not been determined, nor any details of its use. along with a possible graded aircraft parking area on the southern side. running parallel along the east side of North Lake Pleasant Road. 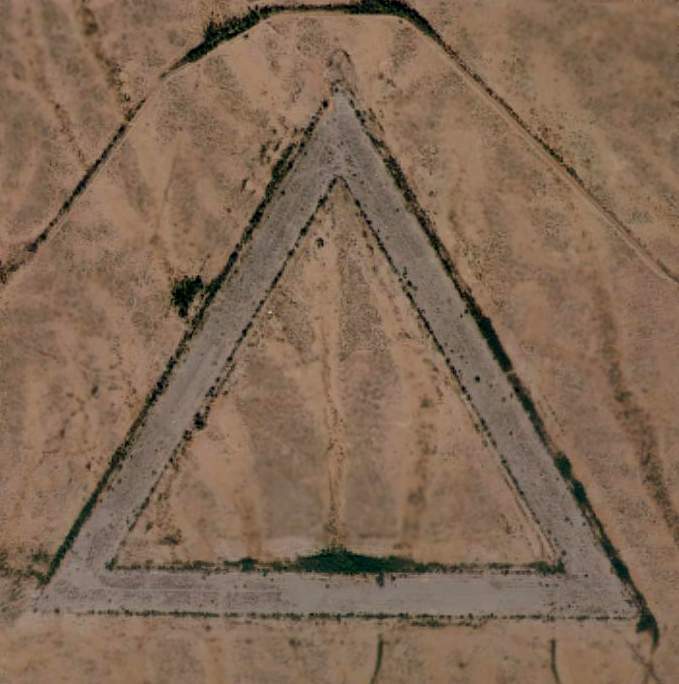 In this circa 2001 aerial photo the outline of the runway was still barely perceptible on the desert floor, if you know where to look. It appeared as if the runway was never paved, but was just a graded dirt surface. erasing any trace of this largely-unknown former airfield. The airfield is located northeast of the intersection of North Lake Pleasant Road & West Pinnacle Vista Road. 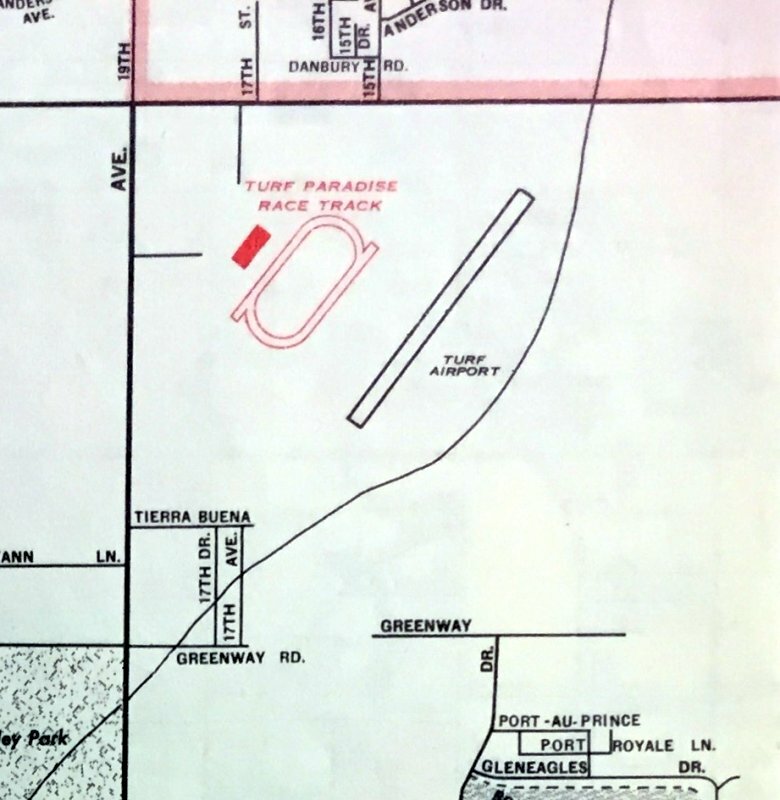 Turf Paradise Airfield, as depicted on the January 1964 Phoenix Sectional Chart (courtesy of Chris Kennedy). 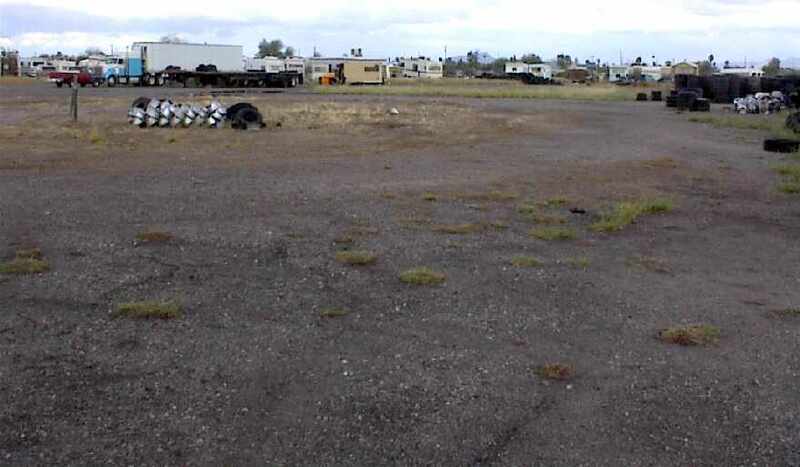 This private airfield was located on the property of the Turf Paradise horse racetrack, which was built in 1954. The precise date of construction of the airfield is unknown. nor on the March 1958 Phoenix Sectional chart (according to Chris Kennedy). (or at least the beginnings of a cleared runway) on the southeast side of the racetrack. "Back in 1959 while getting qualified in taildraggers I used to fly an Aeronca Champ in & out of Turf Paradise. I never saw another airplane there while I was using it." was on the January 1964 Phoenix Sectional Chart (courtesy of Chris Kennedy). It depicted the field as having a 3,300' unpaved runway. 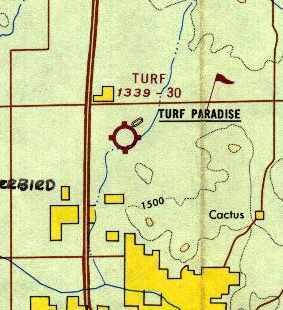 depicted Turf Paradise as having a 3,000' unpaved runway. was a January-March 1969 aerial view (from the Maricopa County Flood Control District). along with at least 9 small general aviation aircraft parked at the southwest end of the field. depicted Turf Paradise Airfield as having a 3,000' unpaved runway. A 1975 street map (courtesy of Kevin Walsh) depicted “Turf Airport” as having a southwest/northeast runway. was on the July 1977 CG-19 World Aeronautical Chart (courtesy of Chris Kennedy). 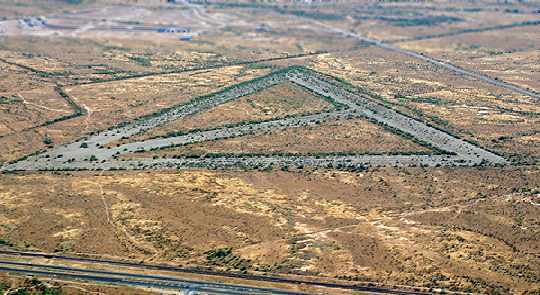 It depicted Turf Paradise as having a 3,000' unpaved runway. 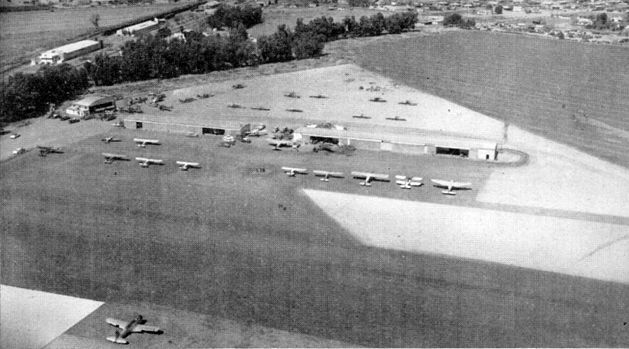 The Turf Paradise Airfield closed at an unknown date after 1977. 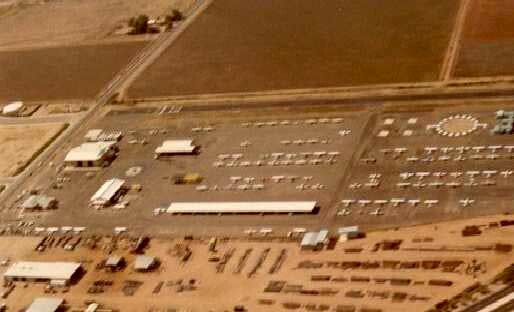 A 1978 aerial view of Turf Paradise, looking east, by Chris Kennedy. The runway was still visible just to the right of the large racetrack, but it is not known if the airfield was still open by that point. with no trace of the former airfield remaining. even though it had already ceased to exist for at least 3 years. 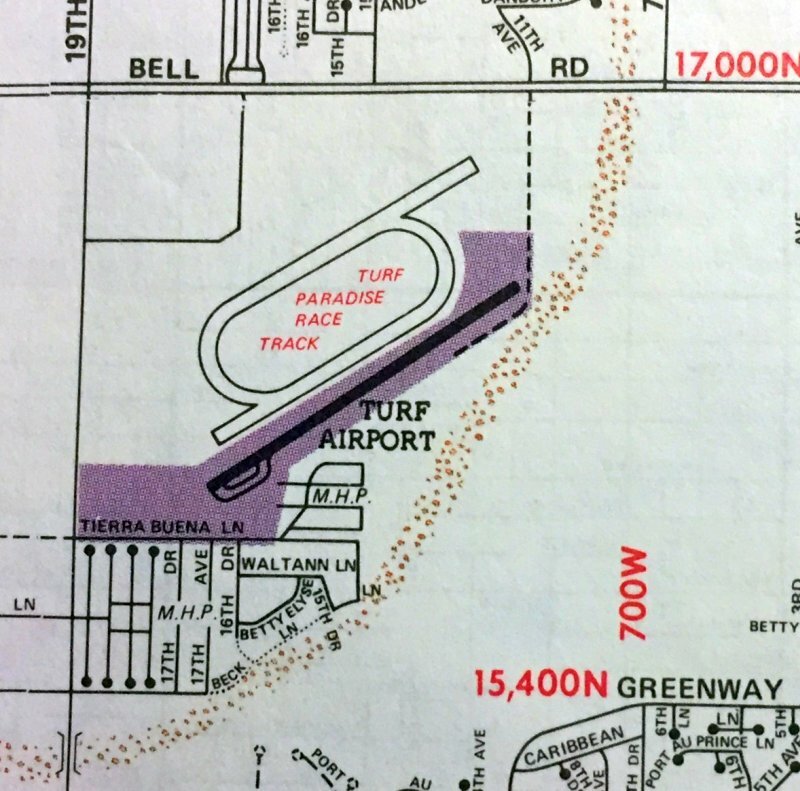 A 1983 street map (courtesy of Kevin Walsh) continued to depict “Turf Airport” as having a southwest/northeast runway. 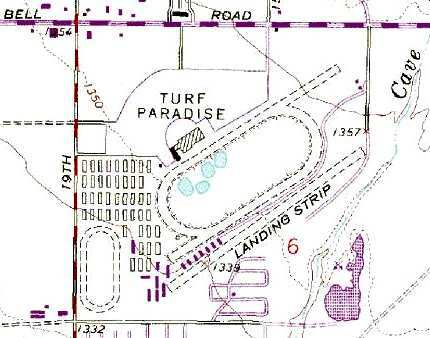 The Turf Paradise runway continued to be depicted on the 1988 USGS topo map, even though it had been built-over for at least 9 years by that point. 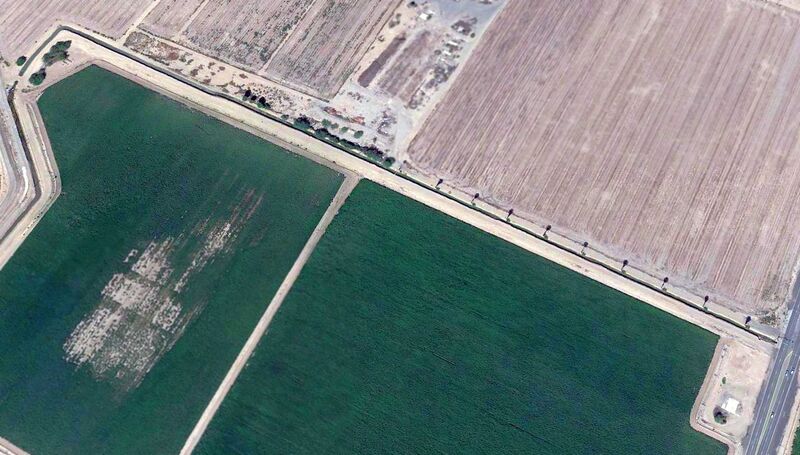 In this circa 2001 aerial photo not a trace of the airfield was still discernible. 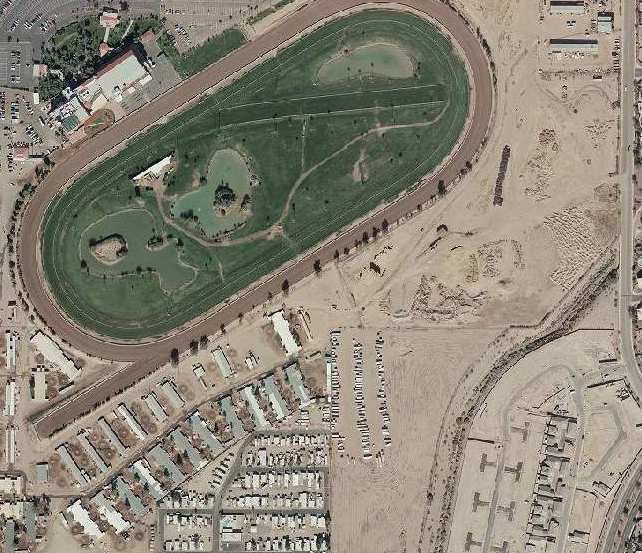 The Turf Paradise Race Course is located southeast of the intersection of Bell Road & North 19th Avenue. 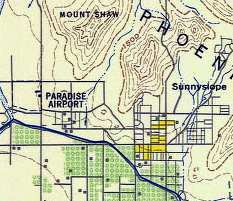 An earlier airfield, Paradise Airport, was located 4 miles to the south of Turf Paradise Airfield. Fram Field, as depicted on the September 1941 Phoenix Sectional Chart (courtesy of Chris Kennedy). "known as Pops to us, was a special person. Ray fell in love with flying as a doughboy in France fighting in the trenches. So after the War [WW1] he returned, married & started learning to fly. His instructor was Bill Landon & he learned in an Eagle Rock, American Eagle, old engine OX5, water cooled. He really liked his instructor. His instructor did not carry a club as some did in those days. The instructor, Bill, was in the front seat & a student in the back. The student froze holding the stick back keeping the plane in a spin. If he had had a bat, he could have turned & knocked the student out. So those 2 spun in." Donalyn continued, "Ray went to South Central Airport, [where] Goldtrap & Lee had a flying service. They had 3 Monopreps (2-place) & one Monocoup (faster than the Monoprep). He flew with them & bought one NC111K built in 1928. It had the name painted on it, 'The Spirit of the Depression'. The inspector did not like it & said paint it out, so he did." Donalyn continued, "It was a fabric plane, so friends came & moved the chicken pens together to shade the plane. With Ray's $600 bonus from the War, he hired a Mexican contractor. Times were tough; labor was 15 cents / hour. Adobe bricks were $25 / 1,000. Part went to make their house & part of the brick made the hangar. Ray became a popular instructor pilot on weekends as he had to farm during the week. Dad said Fram Field was busier on weekends than Sky Harbor was." as he had to get the chores done & they only owned a milk truck." Ray also bought a Portierfield Zepher, a 3570 Portierfield #16498, and a 384H Fairchild KR-34. is on the September 1941 Phoenix Sectional Chart (courtesy of Chris Kennedy). Fram Field was still depicted on the February 1943 Phoenix Sectional Chart (courtesy of Chris Kennedy). Fram Field was not depicted on the March 1945 Phoenix Sectional Chart (courtesy of Ron Plante). described Fram Field as having a 2,100' runway. It depicted the field as having a single unpaved east/west runway, with a small hangar & 2 small aircraft on the east side of the field. Brenda Shears recalled, “I am Max Shears' daughter. My father ran his crop dusting business [at Fram Field]. said “On 99th Avenue & Glendale Avenue is Fram Field. Max Shears & Bill Mason have a collection of airplanes that would whet the appetite of any aviation enthusiast. The December 1957 issue of American Airman had an interesting article about the field. Jones New Standard D-25 duster, N19155, Wright R-975-11. New Standard D-25 sprayer, N9194, Lycoming R-690-9. Dave Stevenson recalled, “Fram Field... Max Shears was a well-known cropduster. The earliest ground-level photo which has been located of Fram Field was a circa 1950s photo by Brian Baker of a New Standard biplane, with an unusually large exhaust stack. 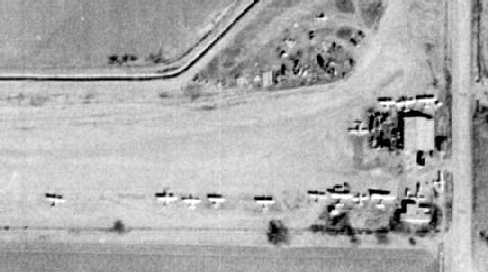 The number of aircraft visible on Fram Field increased to 8 in a 2/20/59 aerial view (from the Maricopa County Flood Control District). A circa 1961-64 photo by Jim Lindsay of the BC-12D Taylorcraft, N96020 he co-owned with Donald Lester, at Fram Field, with 2 of Max Shear's cropdusters in the background (courtesy of Fred Lester). Fred recalled, “Dad parked it at Fram Field. The far cropduster is N19155. My dad learned to fly in 1960. His instructor was Max Shears. I have more memories of the things in the hangar: an engine laying around the hangar, with crates of new engines, government surplus. In the 1962 AOPA Airport Directory, the operator of Fram Field was listed as M. B. Shears. Donalyn Fram Easterday said "The man you have listed as running the airport either sold or gave away the planes. None of the family was living in the Phoenix area at that time to keep tabs on what was happening." lived on & operated this air field from the mid 1960s through the 1980s until it was closed down. My Grandparents lived there for over 30 years while it was Fram Field Aviation. My Grandfather said he leased the property from Mrs. Fram." with a total of 15 single-engine aircraft parked around a few small buildings on the southeast side of the field. depicted Fram Field as having a 2,200' unpaved runway. 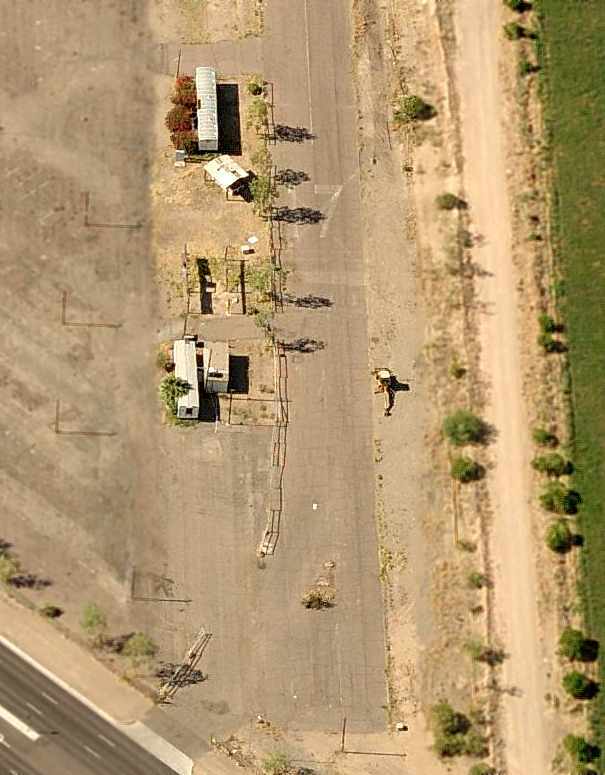 was a 12/15/79 aerial view (from the Maricopa County Flood Control District). A dozen small general aviation aircraft were visible parked at the southeast end of the field. and the operator was listed as Fram Field Aviation. as the Notes said, "Private. Use at own risk. Field closed to all students. W end of field may be flooded." 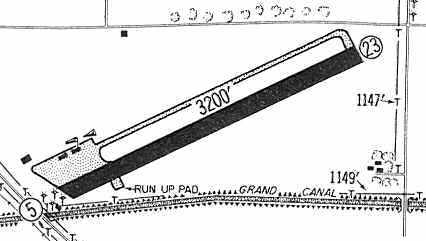 The 1982 USGS topo map depicted Fram Field as having a single 2,600' runway, oriented east/west. According to Michael Grantland (grandson of Fram Field operator Richard Comfort), "It was closed down in 1984." 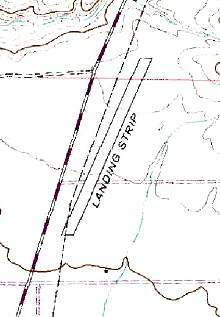 Fram Field was still depicted on the 1988 USGS topo map, but was labeled simply "Landing Strip". A 1992 USGS aerial view looking northwest showed Fram Field was still intact several years after it had been closed, including the runway & the hangar on the east side. 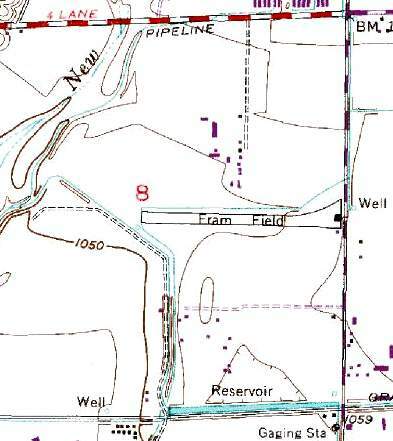 Fram Field was no longer depicted at all (even as an abandoned airfield) on the 1998 Sectional Chart. the property is still in the family & it was a part of aviation history in the area." An 11/6/13 photo by Chris Kennedy looking west at what appears to be a Fram Field foundation, southwest of the intersection of 99th Avenue & Maryland Avenue. A 2016 aerial view looking northwest at the site of Fram Field shows no trace remaining of the runway, with the land having reverted to farming. The last remaining trace of the little airfield is the foundation of the hangar on the east side (bottom-right). 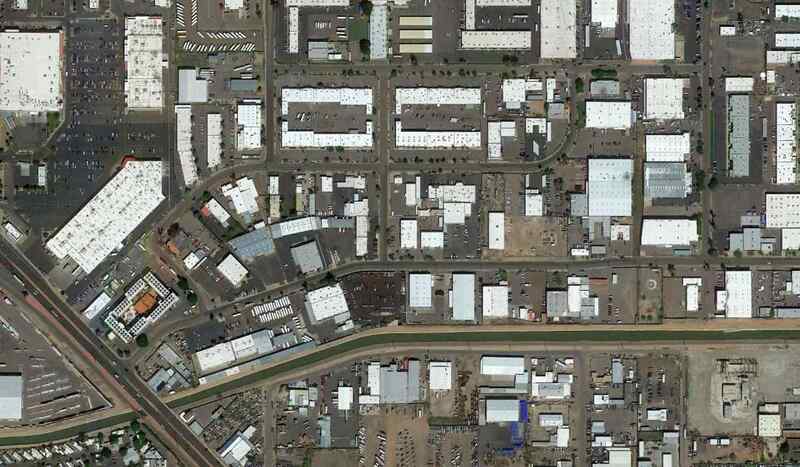 a half mile east of the present-day Glendale Municipal Airport. 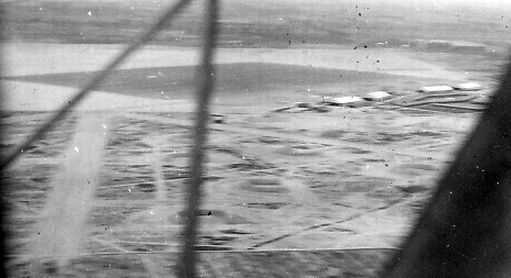 The earliest photo which has been located of Luke “Satellite Field #3” was an 8/29/42 USAAF aerial view (courtesy of Brian Rehwinkel). being first known as Luke Satellite Field #3, then as Luke Auxiliary Field #1.
which was the largest single-engine advanced training base in the world during WW2. served as the training site for P-40 operations when Luke Field became too congested with aircraft. 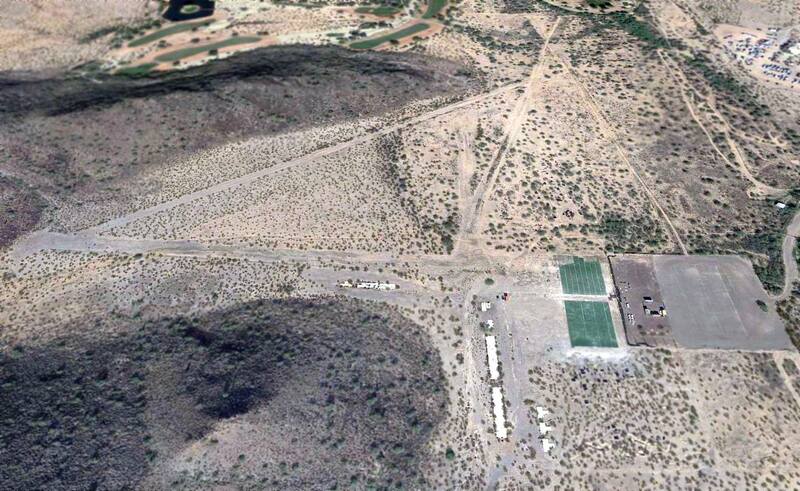 Wittman Field was located 4.5 miles south of the Arizona town with the same name & was activated on July 1, 1941." with a 300' x 3,600' landing strip bisecting the center. The 4-runway configuration… cost $300,000 to construct. Wittman Field facilities were limited to a control tower, crash truck shed & a generator shed. was an 8/29/42 USAAF aerial view (courtesy of Brian Rehwinkel). It depicted the field as having 4 paved runways, with a cluster of small buildings or tents to the northwest. 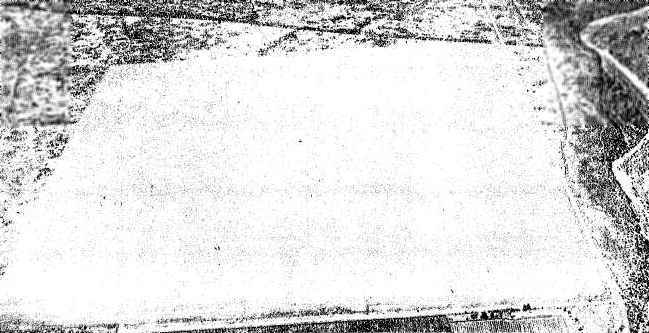 The east/west runway had the field elevation of “1531” painted in the middle, and the field designation “3” was painted inside a large circle on the eastern end. By the time of a 12/2/42 USAAF aerial view (courtesy of Brian Rehwinkel), it was captioned as “Aux. Field #A1”. 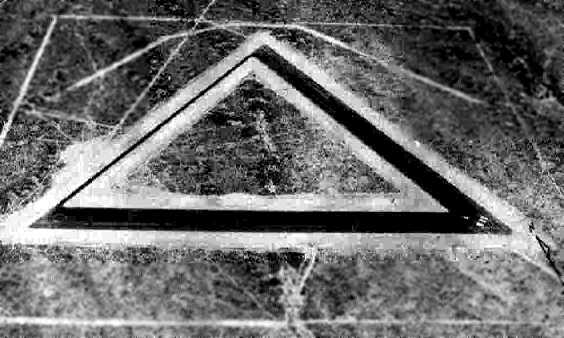 The physical airfield configuration was unchanged, including the airfield designation of “3” inside a large circle on the eastern end. Closed-runway “X” symbols were painted on the west & northeast runway ends. 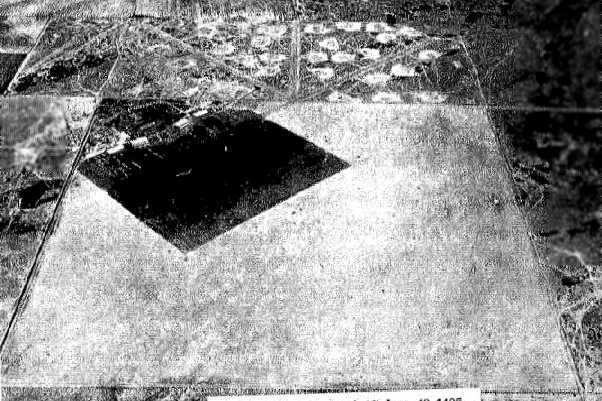 A 6/7/44 aerial view looking northeast from the 1945 AAF Airport Directory depicted Wittman as having 4 paved runways. 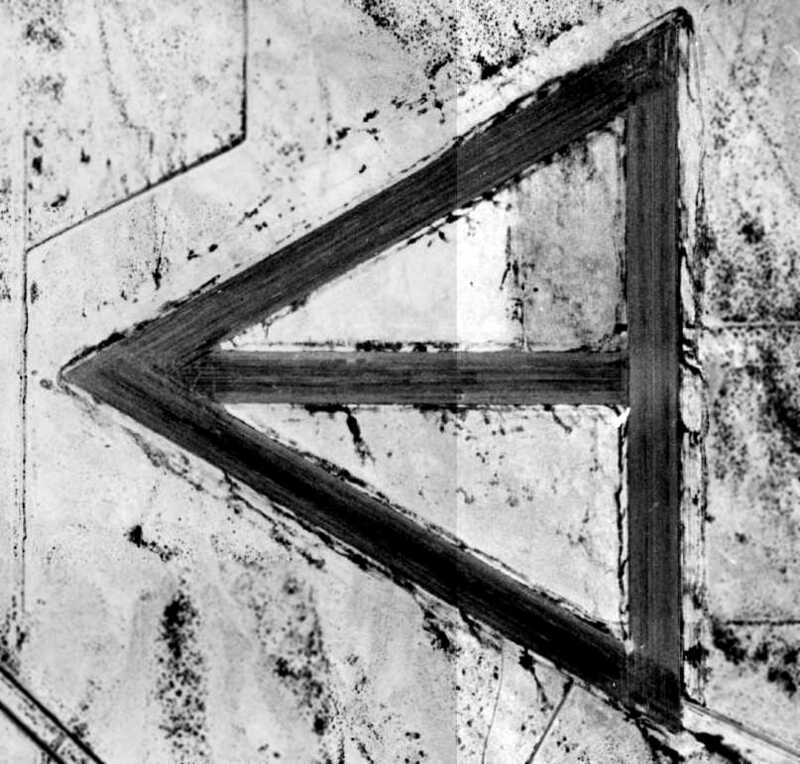 It depicted Wittman "#1" as an auxiliary airfield. with the longest being the 4,000' northeast/southwest, WNW/ESE, and NNW/SSE strips. The field was described as not having any hangars, and to be operated by the Army Air Force. "It remained a Luke Field asset through the base’s inactivation in 1946." 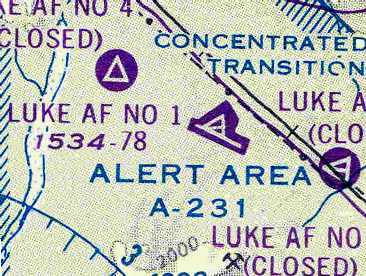 The 1947 Gila River World Aeronautical Chart depicted Luke AF #1 as having a 3,900' paved runway. 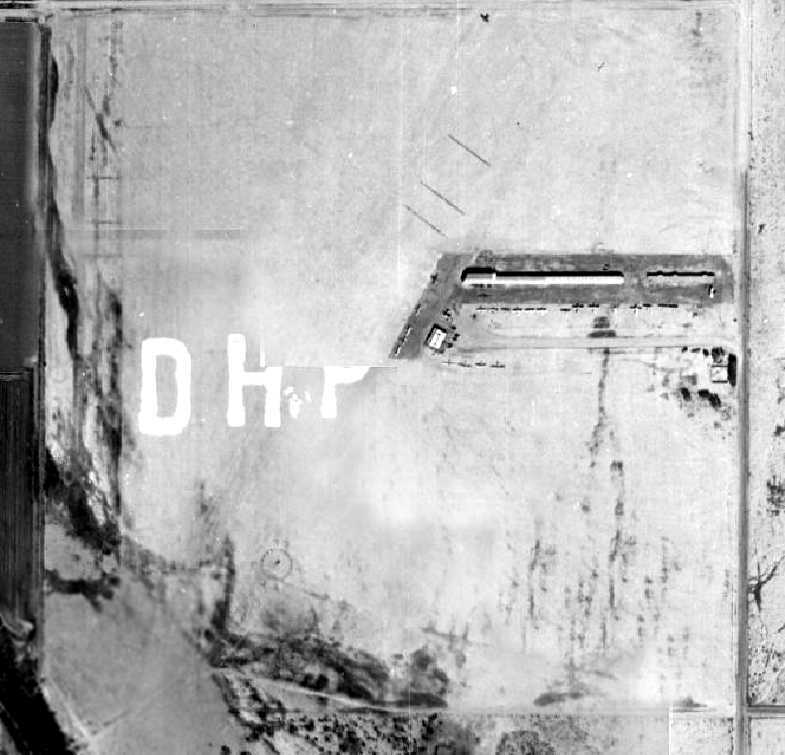 as depicted on a 3/31/53 USGS aerial view. and described as having an 8,800' runway. This airfield was apparently one of the last of Luke's many surrounding WW2-era satellite airfields to remain open. on the 1966 Phoenix Local aeronautical chart (courtesy of John Voss). depicted Luke AF #1as having 4 paved runways, with the longest being 7,800'. on the July 1977 CG-19 World Aeronautical Chart (courtesy of Chris Kennedy). It was depicted as having 4 paved runways, with the longest being 7,800'. 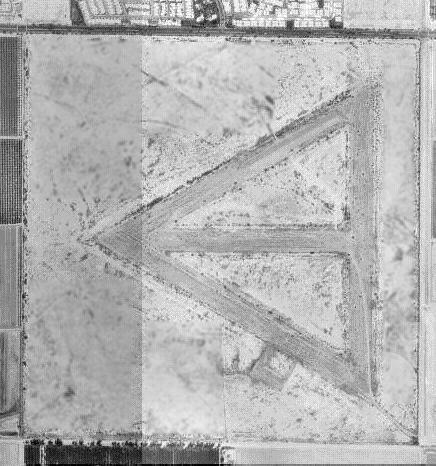 as it had yellow Xs painted along the length of Runway 11/29 on a 1993 aerial view. But the runway also appeared to have relatively-recent runway markings. 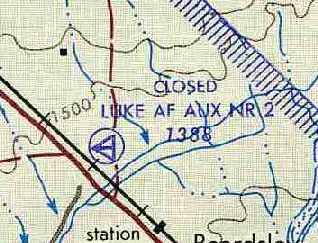 Luke Auxiliary #1 was depicted as an abandoned airfield on the 1998 Sectional chart. showing their location relative to Luke AAF/AFB. while the primary runway was eventually further lengthened to its current size of 10,000'. 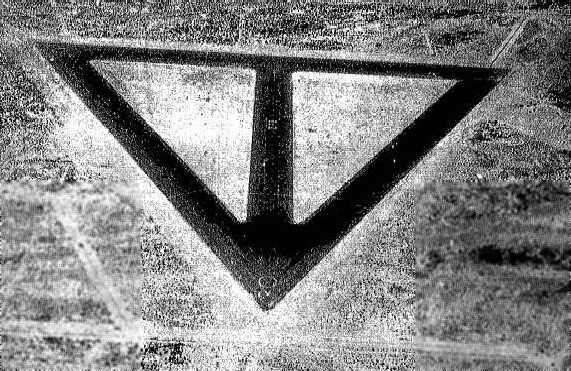 (and also did not include the "X" symbols of a closed runway). new navigational radio & radar equipment has been installed by the USAF at the Wittman airfield in recent years. (which are not continued all the way toward a landing). while this abandoned airfield has an elaborate set of ground-based instrument approach aids! have to do a number of instrument approaches before their "qualification" checkride. Aux 1 was equipped with a Precision Approach Radar (PAR) and a localizer/ILS to the abandoned runway. All approaches are to Runway 11 (from the Northwest). I don't know when this was done, but it's been operating for quite a while. then continue back to Luke, which is just over the White Tank Mountains. because of the breakdown & foliage growth." 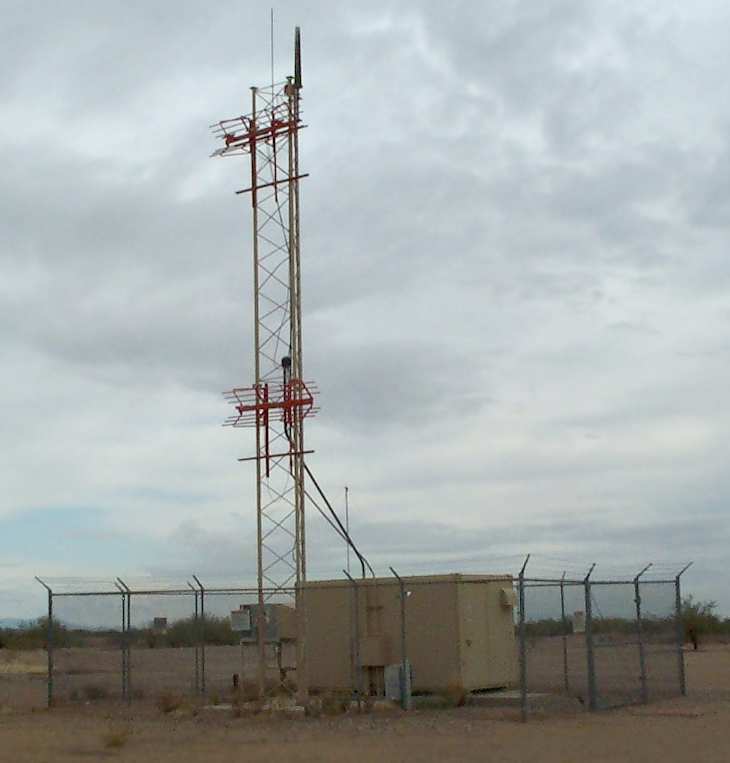 A 2002 photo by a local AZ pilot of the localizer antenna at Wittman Aux. and 2 white 'T's painted about where the runway thresholds should be." 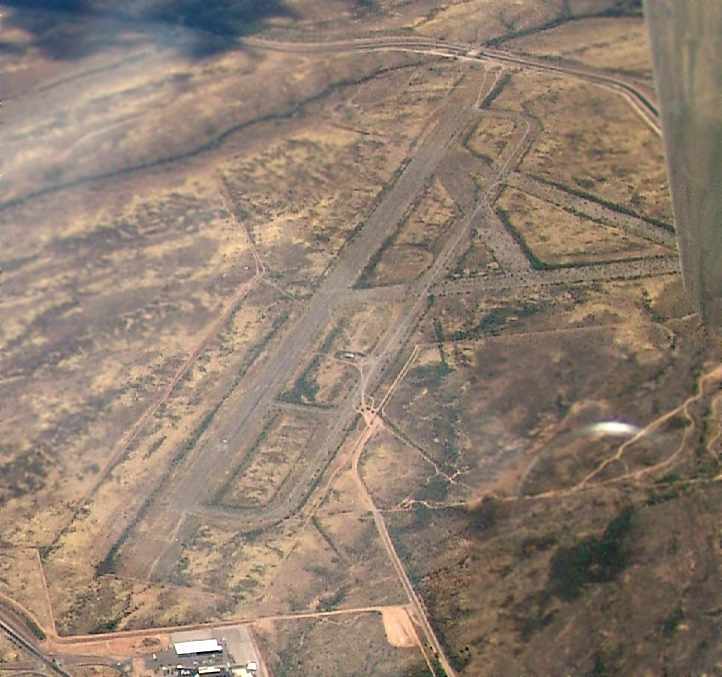 A 2002 photo by a local AZ pilot of a glideslope antenna at the end of Runway 29 at Wittman Aux. with the facilities of Ford's Volvo Arizona Proving Ground visible at the bottom-left. 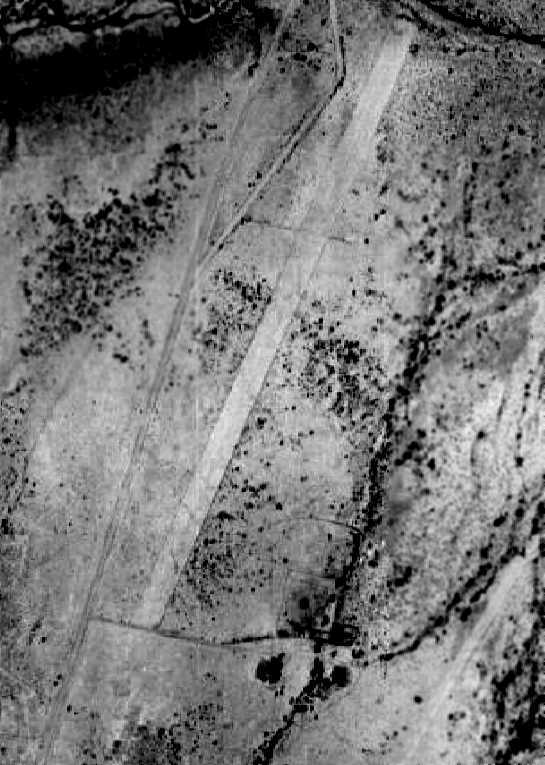 A 3/10/19 aerial view by Tim Gagnon looking east at the remains of Luke Aux #1.
was a June 17, 1943 aerial view looking east from the 1945 AAF Airport Directory. "The origination date of [Beardsley Field] is lost to history." with a 300' x 3,600' foot landing strip bisecting the center. Beardsley Field facilities were limited to a control tower, crash truck shed & a generator shed." presumably at some point after Luke Air Force Auxiliary Field #1, which was acquired in 1942. Beardsley also had a 4,000 gallon water tank & a wind tetrahedron. 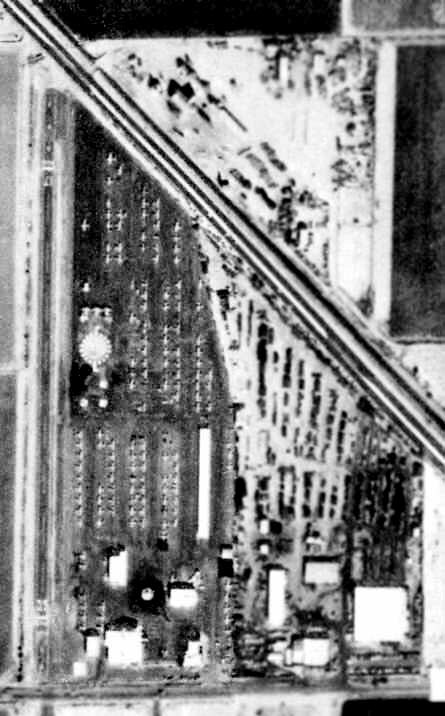 was a June 17, 1943 aerial view from the 1945 AAF Airport Directory. It depicted Beardsley as having 4 paved runways. 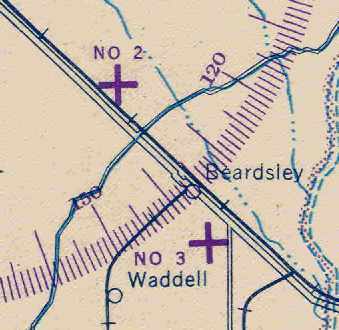 It depicted Beardsley "#2" as an auxiliary airfield. with the longest being the 4,000' ENE/WSW, WNW/ESE, and NNW/SSE strips. 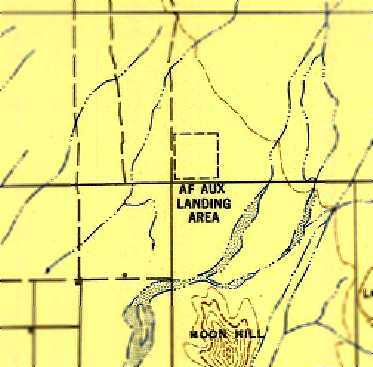 The 1947 Gila River World Aeronautical Chart depicted Luke AF #2 as having a 3,900' paved runway. depicted Beardsley as having 4 paved runways. which described the longest runway as being a 3,800' hard-surfaced strip. According to an Army Corps of Engineers report, after the Air Force completed use of the property, it was sold to a private owner. The north/south runway was used for drag racing at some time in the past. the site was listed as 2.5M N/W of Beardsley on Hwy 60/70/89. 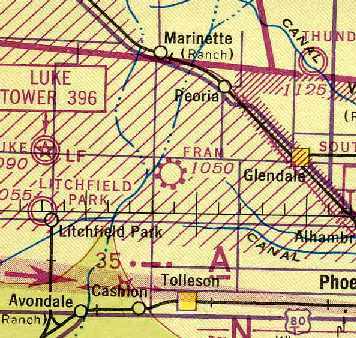 "Luke AF #2" was labeled "Closed" on the 1964 Phoenix Sectional Chart (according to Chris Kennedy). on the August 1971 USAF Tactical Pilotage Chart (courtesy of Chris Kennedy). the airfield consisted of 4 paved runways (the longest is approximately 3,800' long). According to a 1998 Army Corps of Engineers report, all facilities (except for the runways) have been removed from the site. The current owner leases the property to a rancher for cattle grazing. the runways of Luke Aux #2 appear to remain in the same condition as depicted in 1997.
showing that over half of the airfield has been removed for new construction. A November 2009 photo by Chris Kennedy looking north along part of the north/south runway of Luke Auxiliary #2. Chris observed, “Access is less than ideal. Only a little less than half of this runway is left & this is taken looking north from the south end of the remaining portion. It's not really recognizable as a runway from this angle, just an area where the bushes are a little smaller. 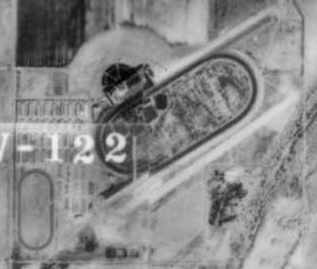 The earliest photo which has been located of Luke “Satellite Field #1” was an 8/29/42 USAAF aerial view (courtesy of Brian Rehwinkel). 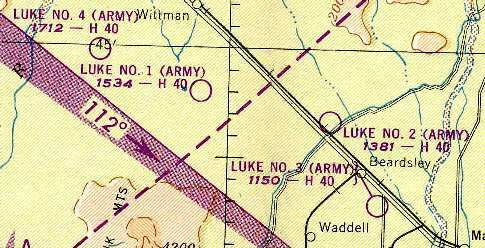 being first known as Luke Satellite Field #1, then as Luke Auxiliary Field #3.
as it was not yet depicted on the September 1941 Phoenix Sectional Chart (courtesy of Chris Kennedy). According to an Army Corps of Engineers Report, the 656 acre property for Luke Aux #3 was originally acquired in 1942. "Auxiliary Field Number 3 was simply referred to as Fighter Field. and became a Luke Field asset on December 1, 1942." pit latrine, crash truck shed, generator shed & a control tower. Building construction cost totaled $24,500. was the most expensive purely auxiliary field owned by Luke during the era." It depicted the field as having 4 paved runways, with a cluster of small buildings or tents to the southwest. 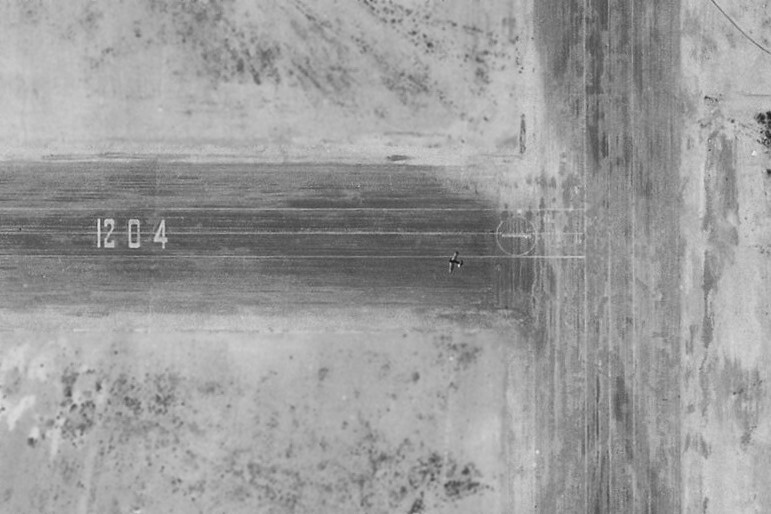 The east/west runway had the field elevation of “1204” painted in the middle, and the airfield designation “1” inside a large circle on the eastern end. showing a single-engine plane on (or overflying) the east/west runway of Luke “Satellite Field #1”. A 6/17/43 aerial view looking east from the 1945 AAF Airport Directory depicted Luke Aux #3 as having 4 paved runways. Auxiliary Field #3 remained a Luke Field asset "until surplused on February 1, 1946." The 1947 Gila River World Aeronautical Chart depicted Luke AF #3 as having a 3,900' paved runway. depicted Luke Aux #3 as having 4 paved runways, with a small paved ramp on the southwest side. 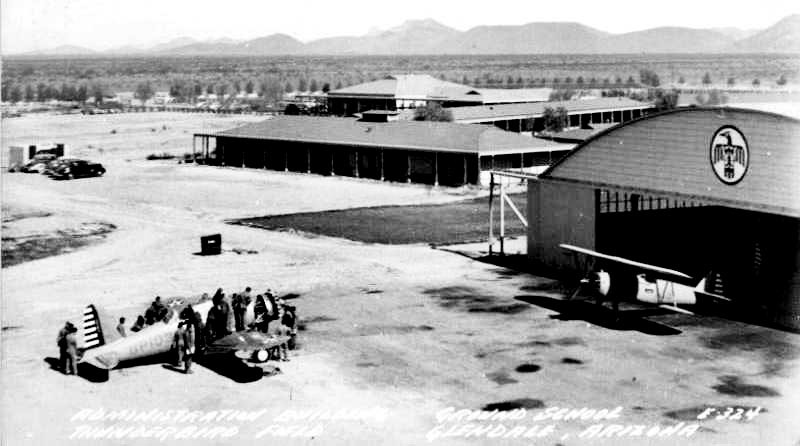 The airfield property was conveyed to the City of Phoenix in 1949.
and the air field was reestablished for military use. on the 1949 Phoenix Sectional Chart (courtesy of Chris Kennedy). Top Speed Magazine, 1952, mentioned that the Kluster Busters car club held weekly drag races at Luke Field, Auxiliary #3. The military lease was once again terminated in 1957.
use of the land as an air field as long as Luke Air Force base is used as an air field. on the July 1965 Phoenix Sectional Chart (courtesy of Ron Kunse). 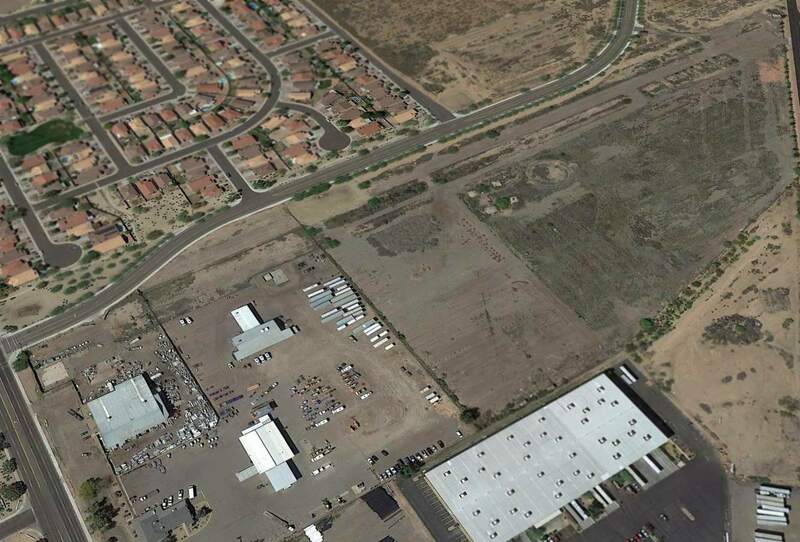 the City of Phoenix recently (2002) exchanged the Luke Aux #3 property for another parcel of nearby land. The new owner intends to develop it into residential housing. 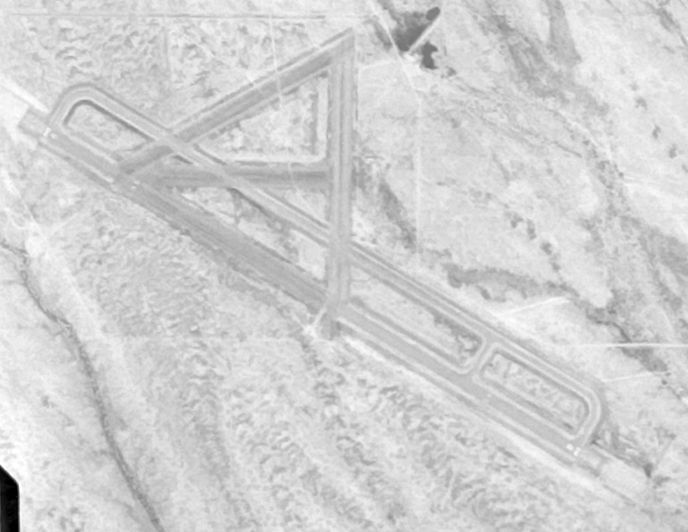 As seen in the above 1997 USGS aerial photo, the airfield consisted of 4 paved runways (the longest was 3,800' long). Three of the runways have been overgrown by vegetation. The 4th runway is surfaced with asphalt & is used by permitted radio controlled airplane operators. and no evidence of remaining concrete pads has been found. The large Sun City West community is adjacent to the airfield to the north. adjacent to the west side of the Luke Aux #3 airfield, not over the airfield itself. 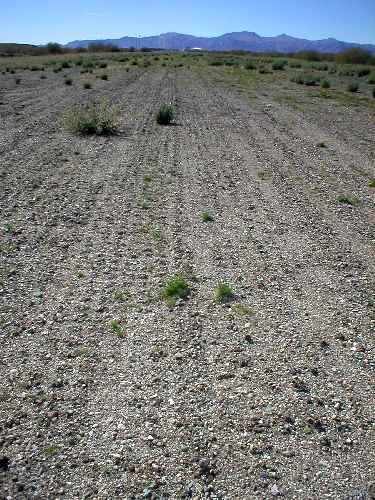 A 2004 photo by Bret Kepner, looking southwest along a former runway at Luke Aux #3. The light towers of the baseball complex which has recently been built adjacent to the west side of the airfield are visible on the horizon. and walked (freely, I might add) to the northern runway intersection." Bret observed that the "new massive ballpark complex"
had been built adjacent to the west side of the Luke Aux #3 property to the west. although a recreational complex had covered much of the western portion of the former airfield. but the majority of the runways still remained intact. from the 1945 Army Air Forces Directory of Airfields (courtesy of Scott Murdock). This field was also known as "Wickenburg Field"
(which could lead to some confusion with Echeverria Field, which was actually located in Wickenburg). and was "built during the period July - August 1942." was a 6/17/43 aerial view looking north from the 1945 Army Air Forces Directory of Airfields (courtesy of Scott Murdock). It depicted the field as having 3 asphalt runways. oriented NNE/SSW, ENE/WSW, and northwest/southeast. 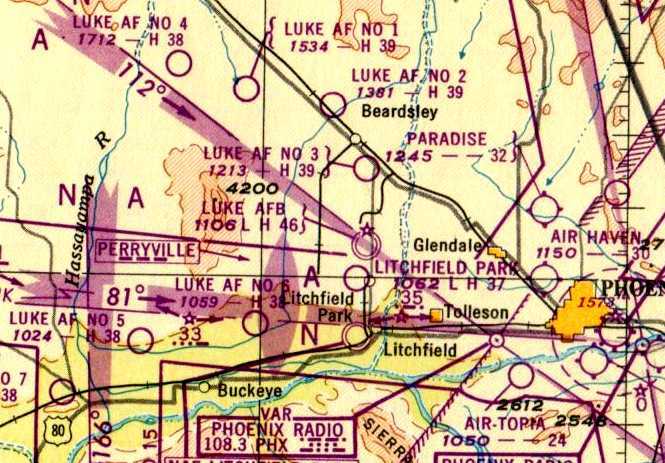 The 1947 Gila River World Aeronautical Chart depicted Luke AF #4 as having a 3,800' paved runway. 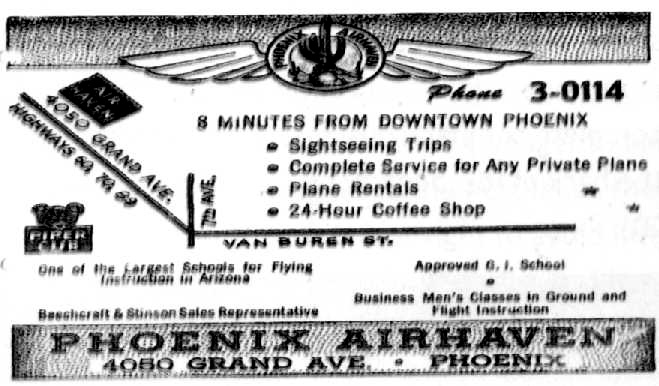 as it was labeled "closed" on the 1966 Phoenix Local aeronautical chart (courtesy of John Voss). 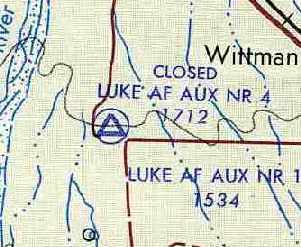 as it was depicted as "Luke Auxiliary Field #4 (City of Phoenix)" on the 1988 USGS topo map. author of the book "Best Place in the Country". 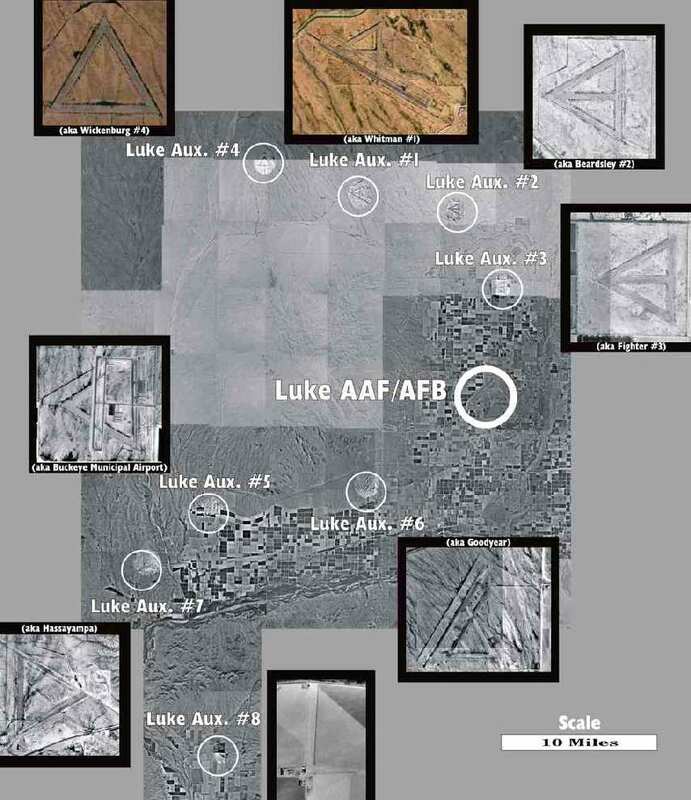 like the large number of other Luke satellite fields. with no sign of any buildings at the site. 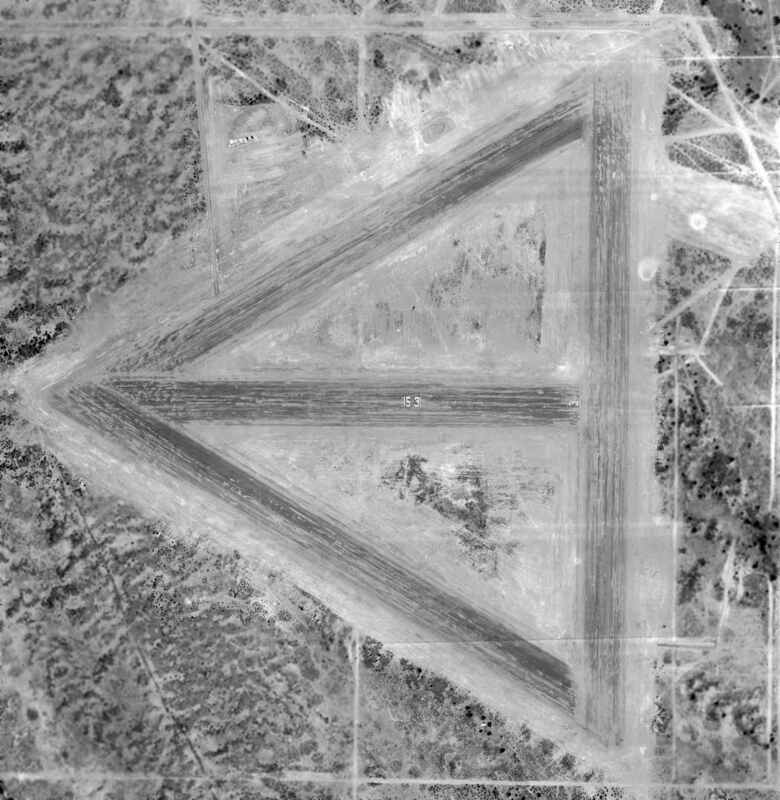 It was still depicted as an abandoned airfield on 2002 aeronautical charts. Steve Hoza (author of the book "Best Place in the Country") took the above 1997 aerial photo of Luke Aux #4. He reported in 2003, "This has changed little since I took this. Mike & I have visited this on the ground & the pavement is still in relatively good shape." the runways of Luke Aux #4 appear to remain in the same condition. 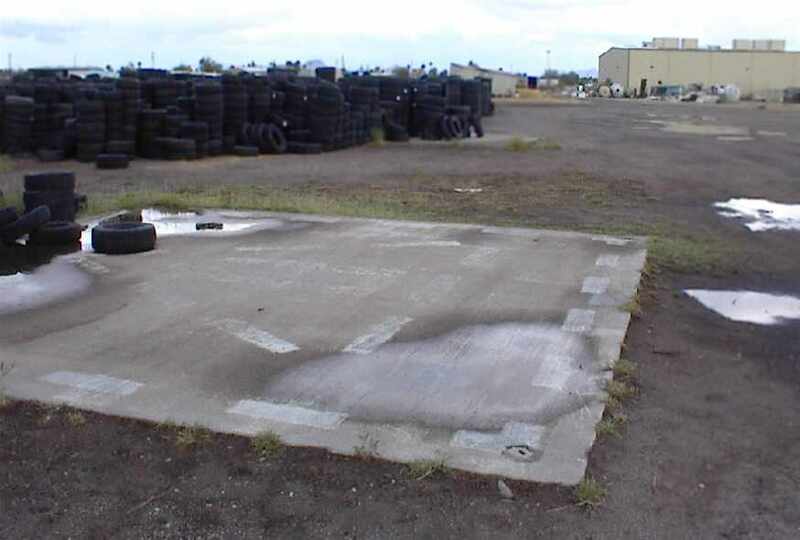 A 2008 photo by Richard Winkler of the remains of a Luke Aux #4 runway. Richard observed, “The condition of the old airfield is poor. The runways have been reduced to gravel with the east side runway being almost completely overgrown by brush, which might indicate it was used the least. but for the most part a darn good option in the event of an emergency landing. and on the southern most runway, there is still a large saturated area of oil in the gravel/asphalt as if something had sat there for a long period of time. A 8/10/08 aerial view of the remains of the Luke Aux #4 runways. A 4/13/15 aerial view by Doug Landers looking southeast at the site of Luke Aux #4. A 3/10/19 aerial view by Tim Gagnon looking northeast at the remains of Luke Aux #4.
six miles southwest of Wittmann.